Sometimes life sends you to places that you hadn’t quite planned, hadn’t even really considered, but says go do something interesting there. So I went to Egypt! 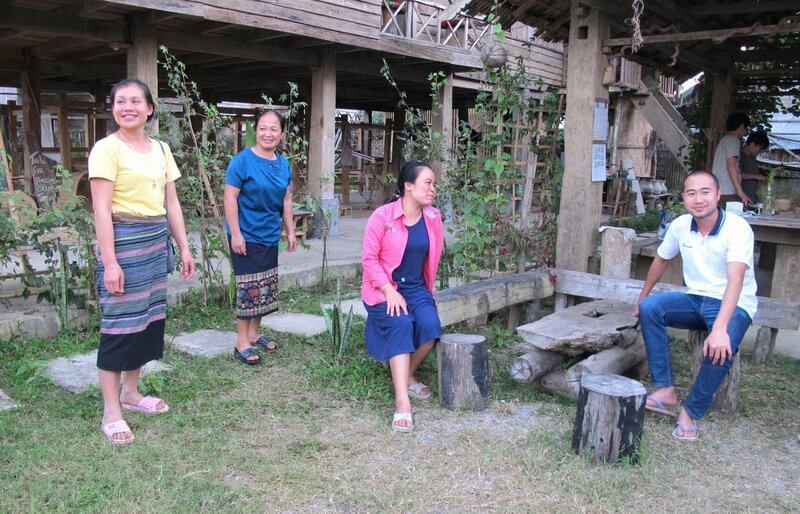 Women artisans celebrating their new bonds of friendships and their accomplishments together from the program. 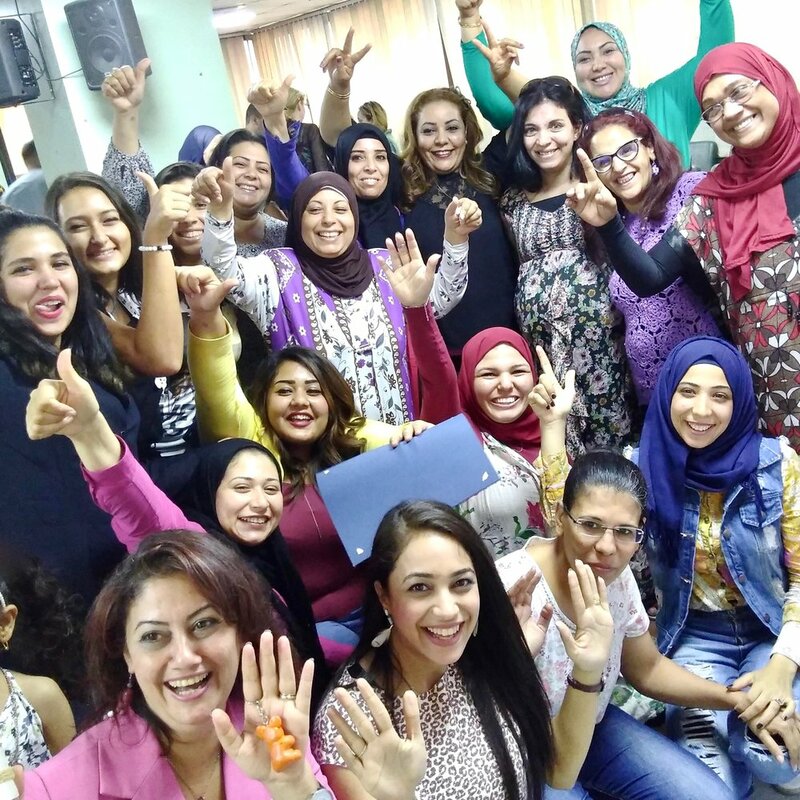 Together with my dear friend, soul sister, fellow creative, and empowering trainer Sharmila Karamchandani, this summer we were invited by the wonderful DC-based non-profit Hands Along the Nile Development Services (HANDS) to design and deliver a customized four-day training on product innovation, quality, and marketing to artisans in Cairo. 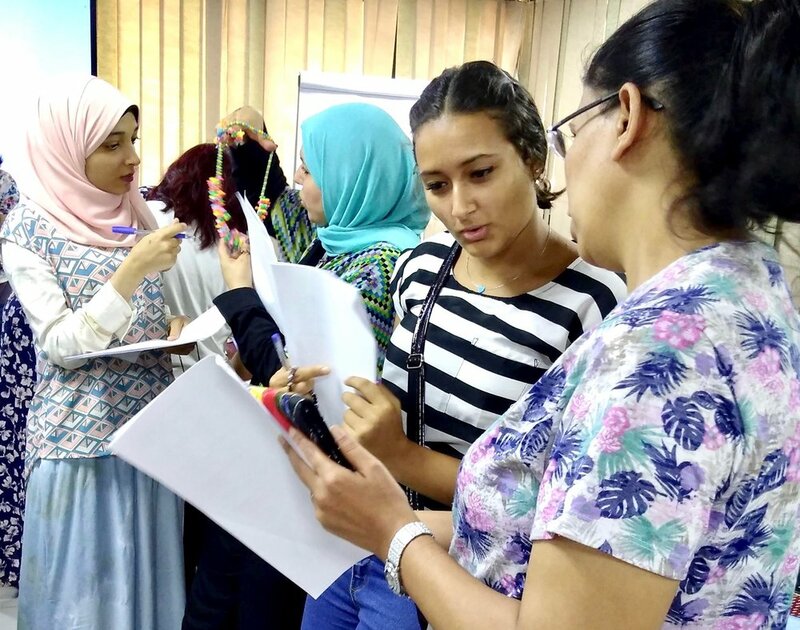 This was in partnership with CEOSS, an Egyptian-based development non-profit, with the support of the US Embassy’s Young Entrepreneurs Program Grant. 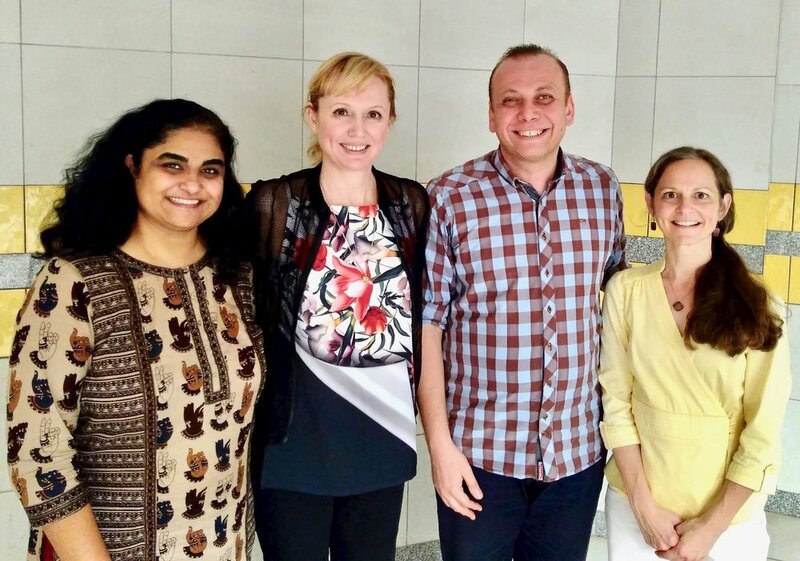 Sharmila Karamchandani (co-trainer), Ivana Smucker (Director of Programs at HANDS), Amir Roshdy (Programs Supervisor at CEOSS), and me. 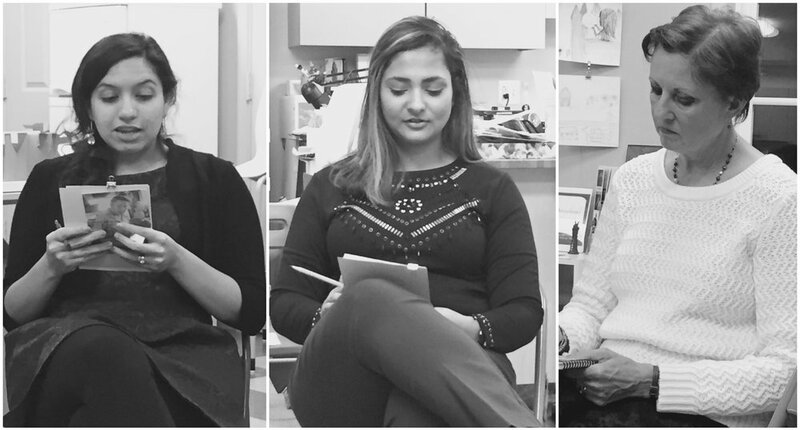 Sharmila and I have known each other for six years, having worked together at Empowered Women International, a non-profit that provides entrepreneurship training and mentorship to immigrant, refugee and low-income women to turn their ideas into successful businesses. 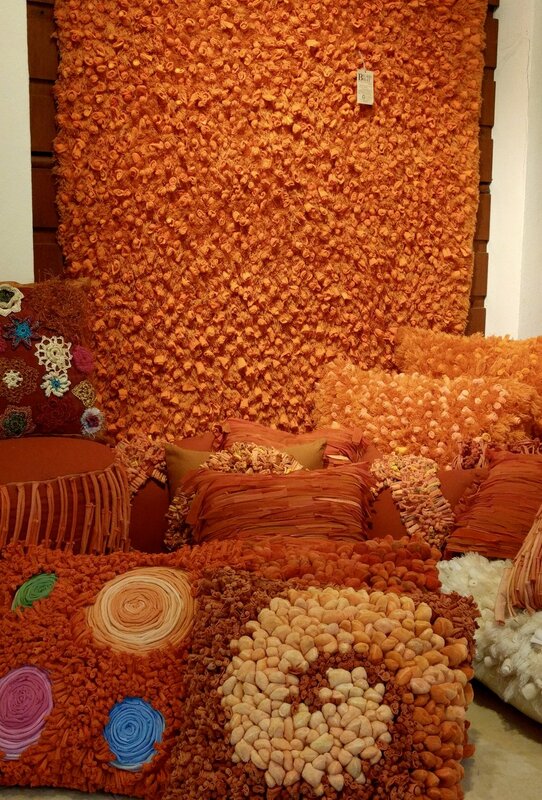 She’s a creative multipotentialite – a design educator at the college level, founder of Khush Designs specializing in customized projects, and an artist whose experimentation and command of multiple media is evident in her range of artwork. We were beyond excited for this dream opportunity. 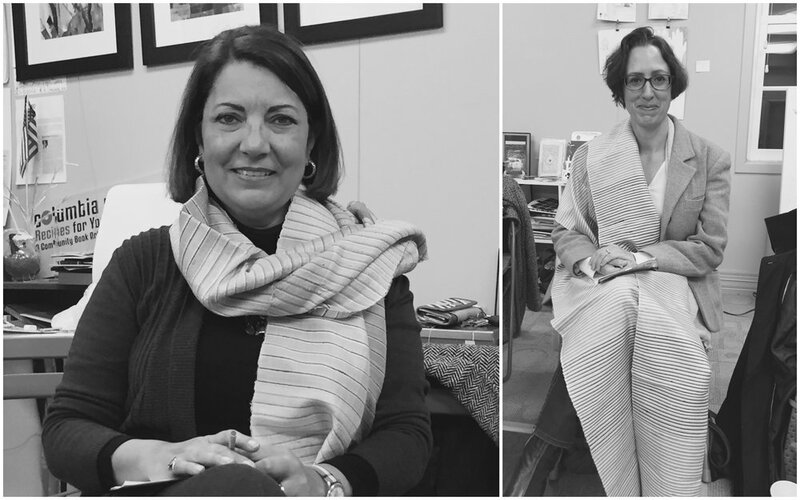 To discover in more detail what the artisans’ particular needs and challenges were, their range of handcrafts, and the cultural context in which we would be working, we met several times with Ivana Smucker, Director of Programs at HANDS. 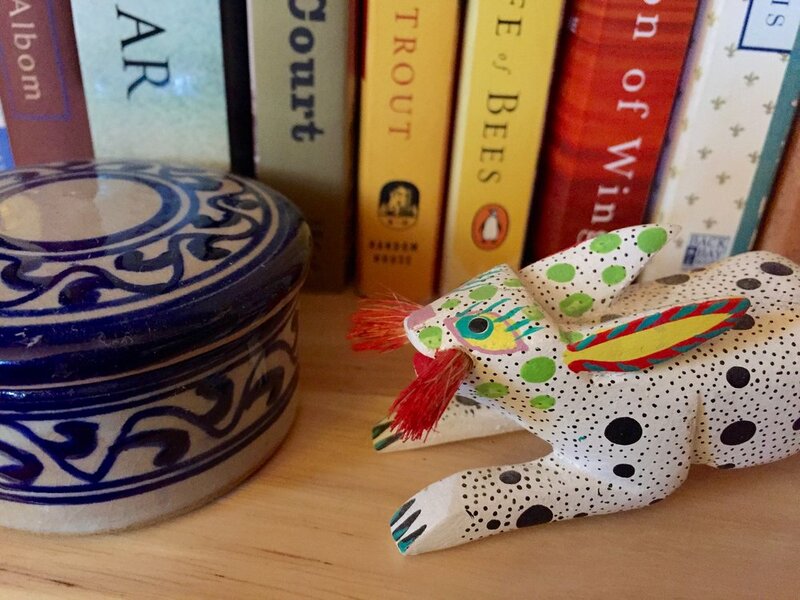 What's your handmade craft telling you? 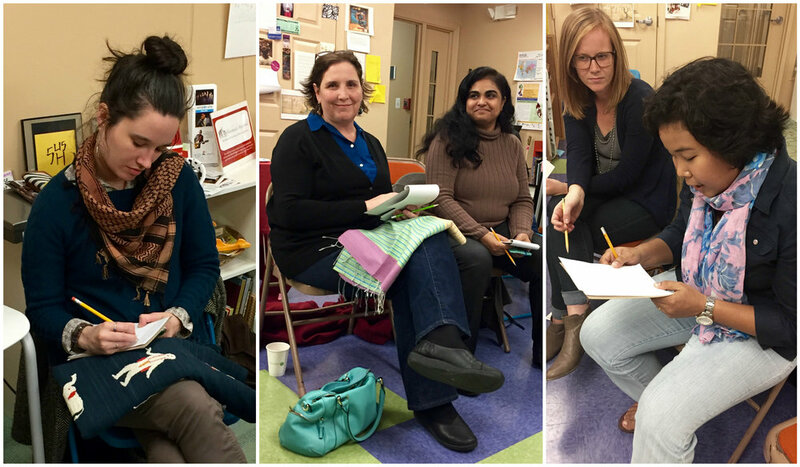 An activity about seeing, feeling, and describing their handmade craft, and about story and connection. Then sharing with each other and they didn't want to stop. 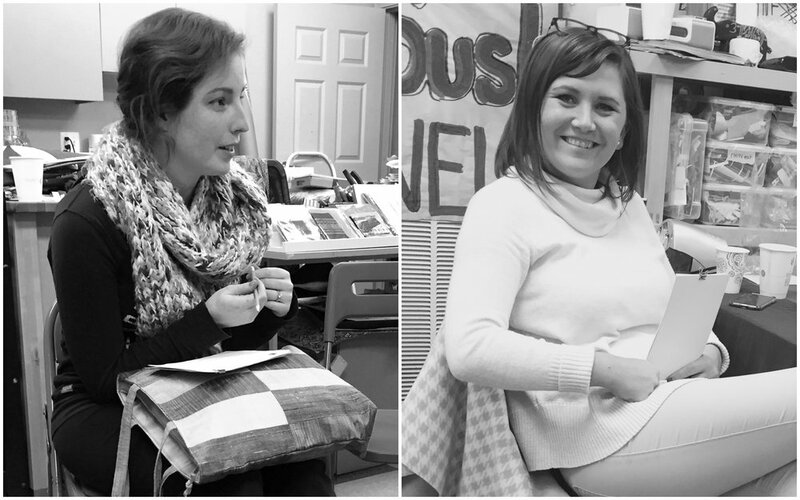 Their potential as creatives was tapped for developing new and improving on their handmade products. 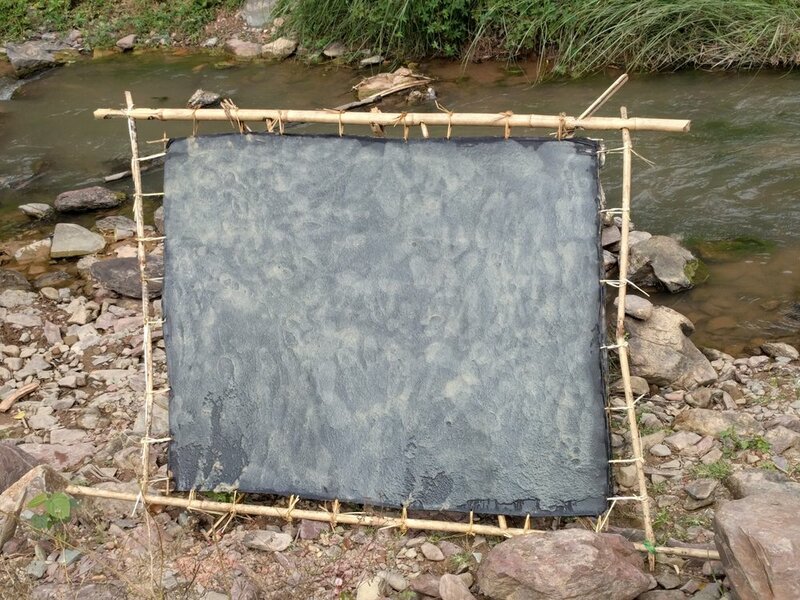 Their own voice and unique story in connecting with their handmade products was validated. 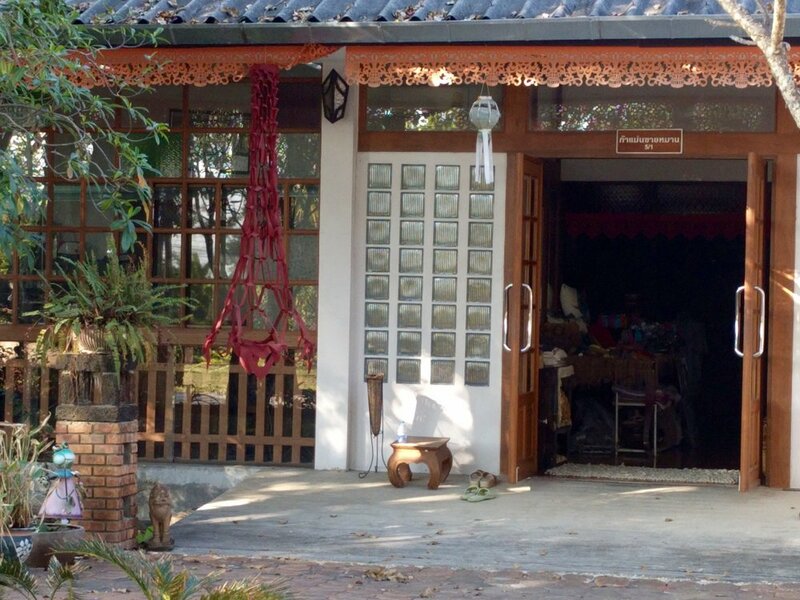 Woman artisans who sew, embroider, and crochet unique handmade clothing and accessories for their local market. 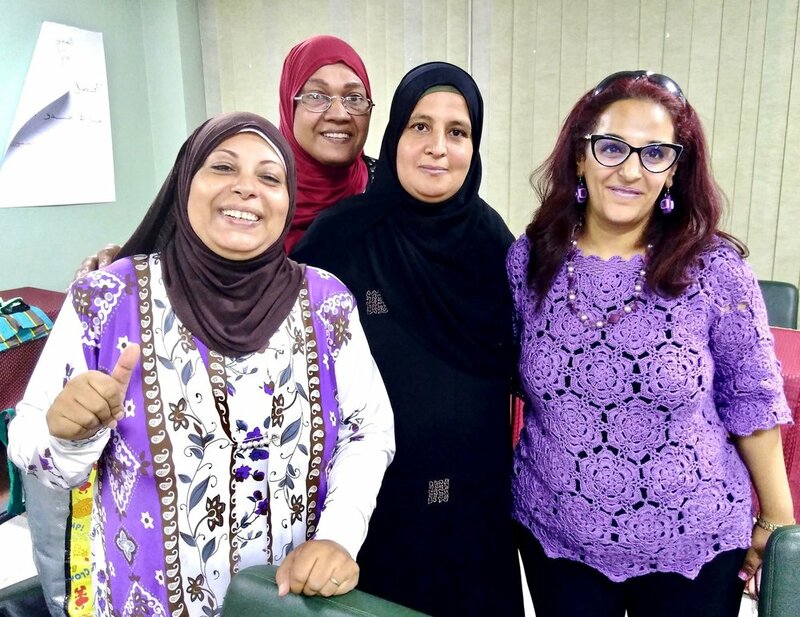 Their understanding of how creating a step-by-step checklist in producing their products was an ‘ah-ha’ moment – for improving on their time and efforts, their skills, and ensuring greater quality control. 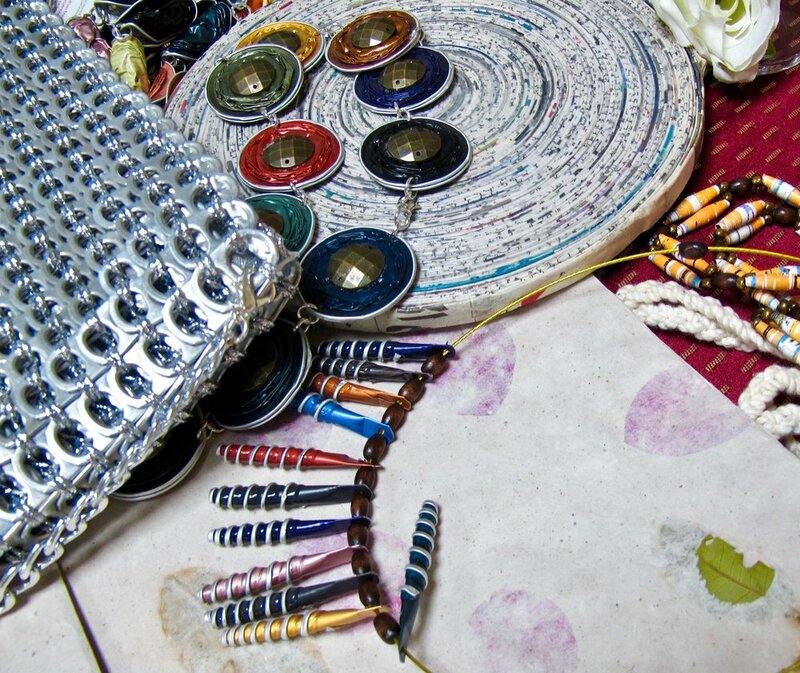 Coffee pod jewelry, can top purses, rolled paper jewelry and place mats, and recycled decorative paper, all innovative handmade products. 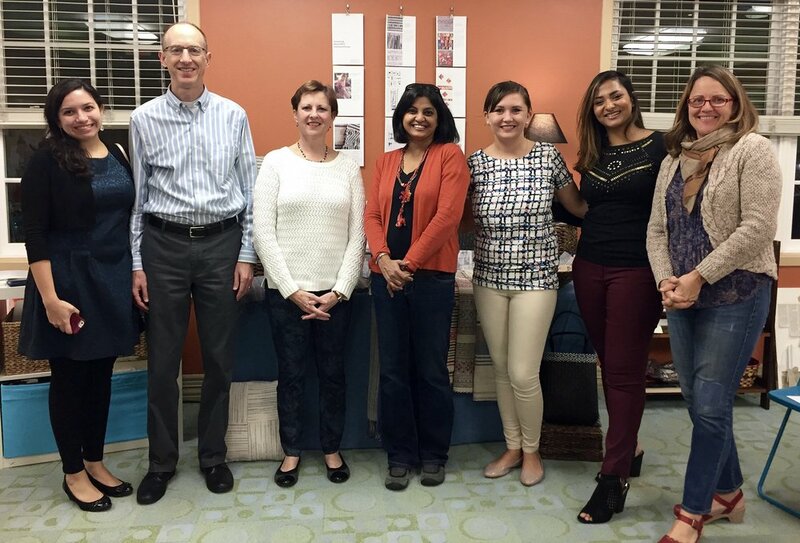 Their ingenuity for finding creative ways to recycle found materials, reuse leftover materials in their production process, and discovering creative ways to salvage imperfect products was a highlight. 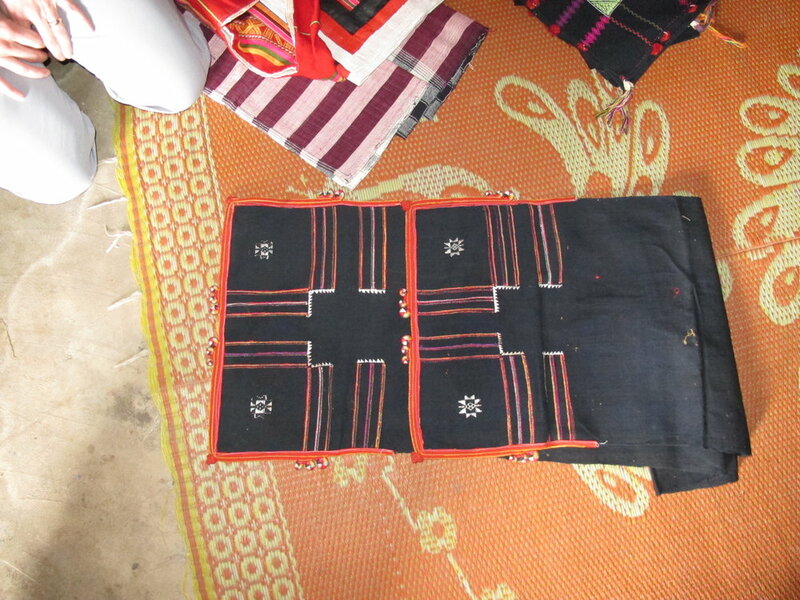 And more – a daughter takes all the leftover items from her mother’s handcrafts and makes new, smaller handcrafts (below); a woman takes leftover fabric clothing from her community and remakes them into child and infant clothing; another doesn’t waste even the tiniest of threads from her embroidery, instead stuffing them inside small pillows. 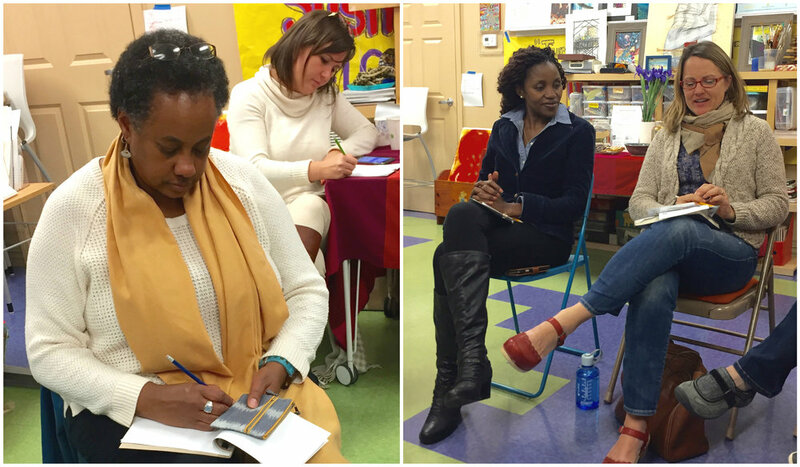 A few of them even started discussing how they could reuse each other’s leftover materials in their own products. That was powerful. It was honestly a wild success, beyond anyone’s expectations. It was a combination of all the right elements that made it so. First, accolades go to the CEOSS staff for organizing everything on their end, especially Amir and Remon, and for the honest guidance and support of Ivana Smucker and Jennifer Cate, Executive Director of HANDS. Then for our phenomenal interpreter Ragaa Ezat, our cultural bridge. 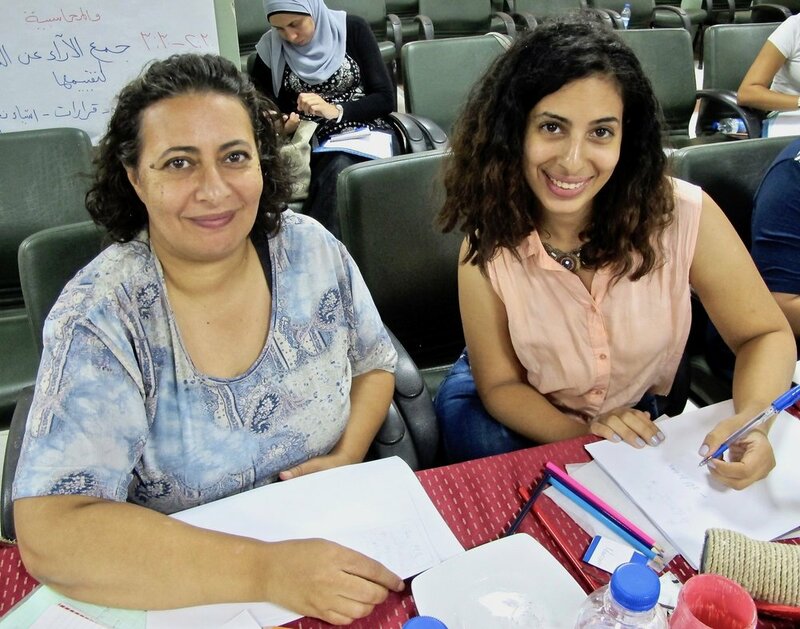 Ragaa (center), with two artisan participants, made all the difference in the world during the training. She conveyed our collective voices and intensions, our hearts and ideas across Arabic and English. We were all so grateful! And most importantly, all the artisans who showed up. They felt heard. They were seen. 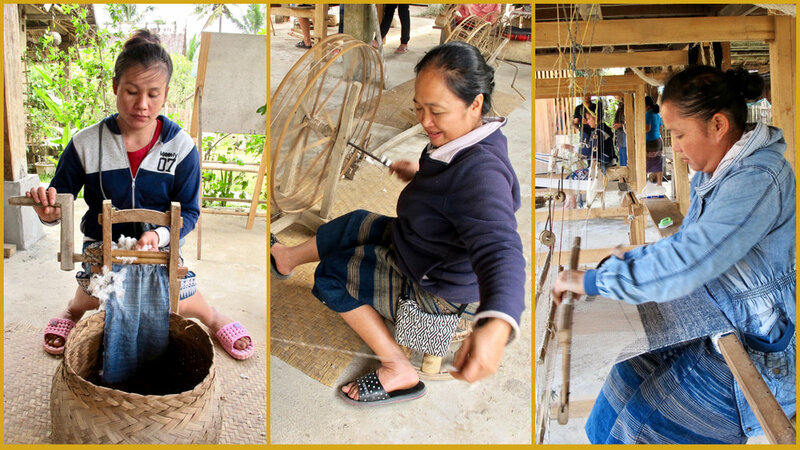 They felt valued as artisans and women with ideas. 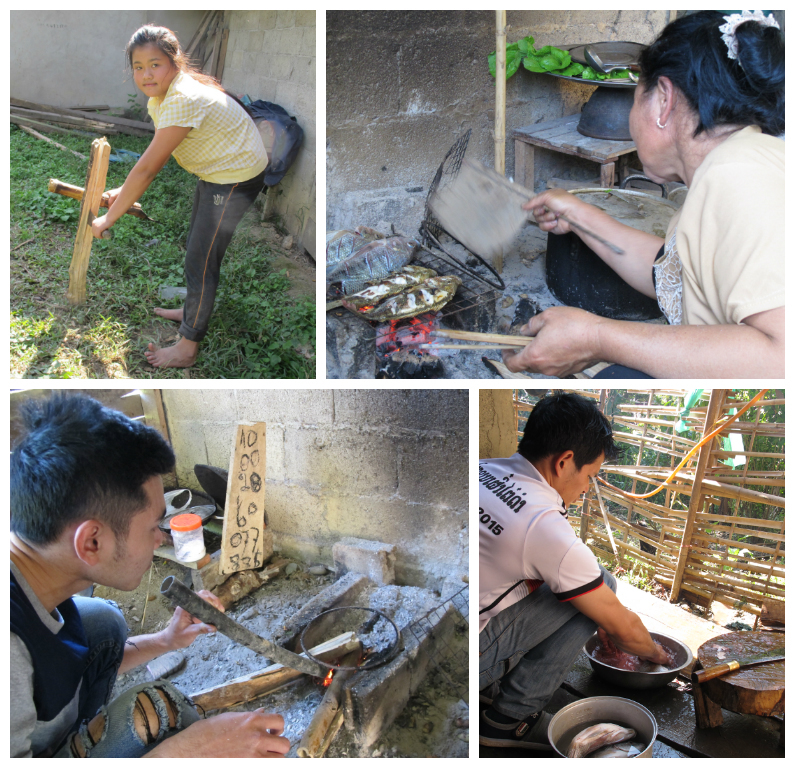 They learned new things about their handmade craft and about themselves. 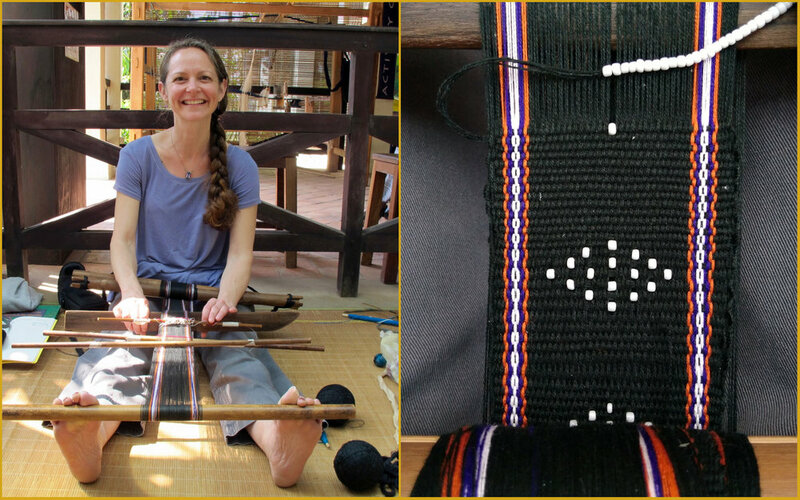 Woodcrafter, candlemaker, and string artist – these phenomenal women were stars. 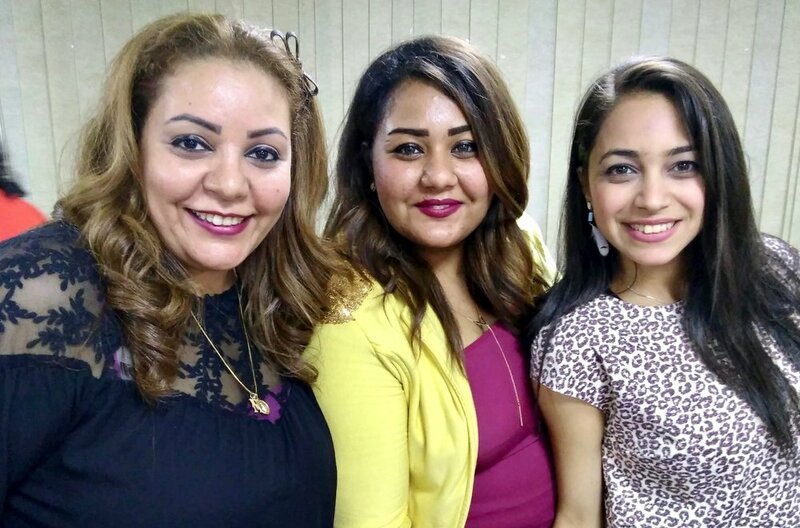 Engy (center) said at the end that she had endless inspiration now. Across language, culture, class, religion, and much that would seem to separate us, instead we all came together from the heart – as creatives, as change-makers, as peacemakers, as women can, as women do. 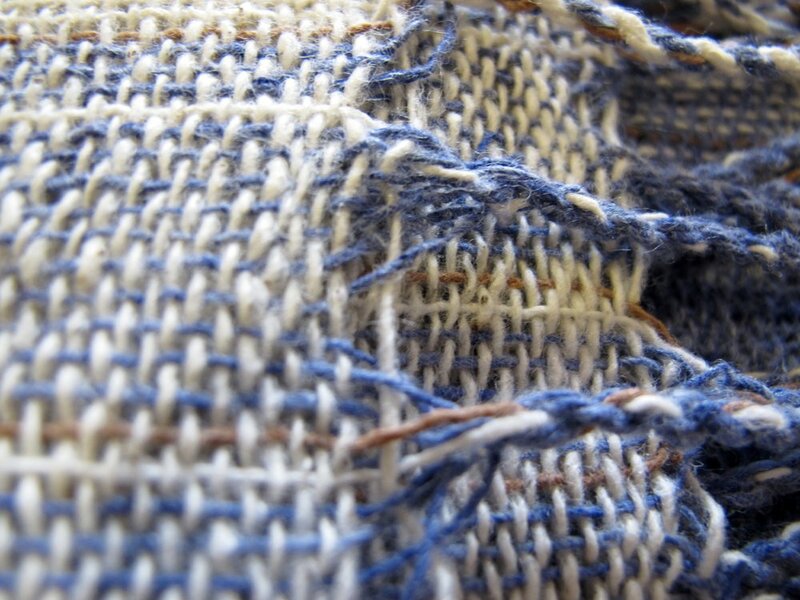 The skill, patience, and focus needed in this intense technique is significant, and I think of the many dedicated women throughout history and the women who continue to create extraordinary textiles all over the world. 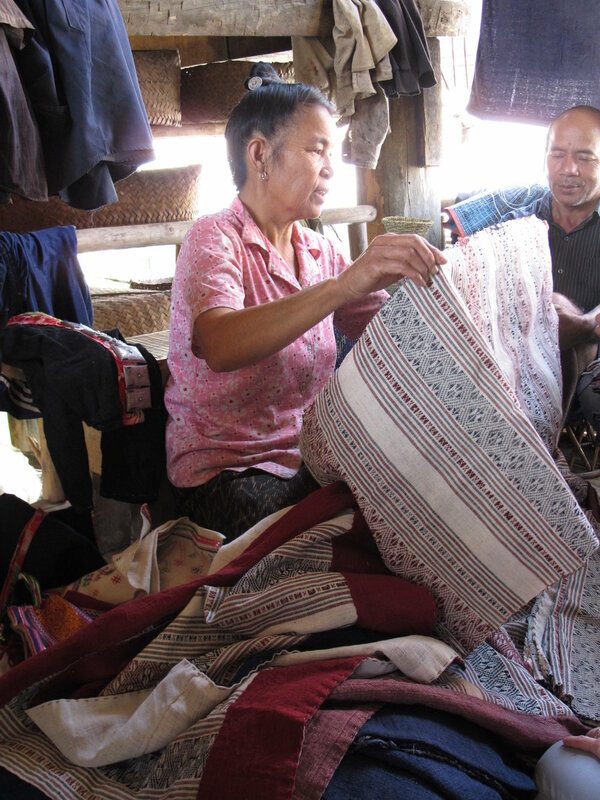 Sinoeun Men had indefatigable energy, like many non-profit executive directors must, and forthcoming to share more than I knew what to ask about handmade textiles in Cambodia. 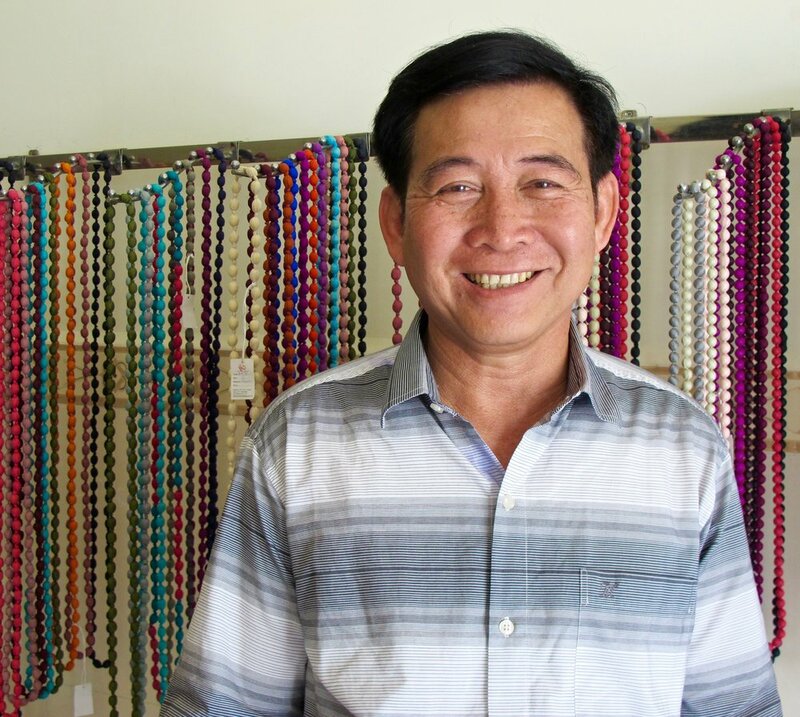 He has led and grown Artists Association of Cambodia (AAC) since 2003, a membership organization that supports its artisan producers with training, technical assistance, compliance of fair trade principles, and connecting to domestic and international buyers. 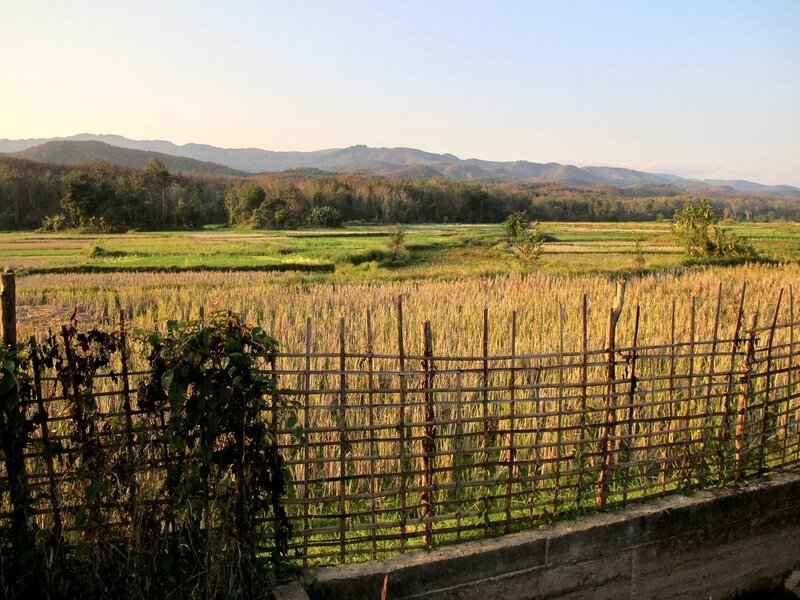 When I reached out to him, two days were soon planned to meet several artisan producers and a road trip to a visit weavers and dyers. 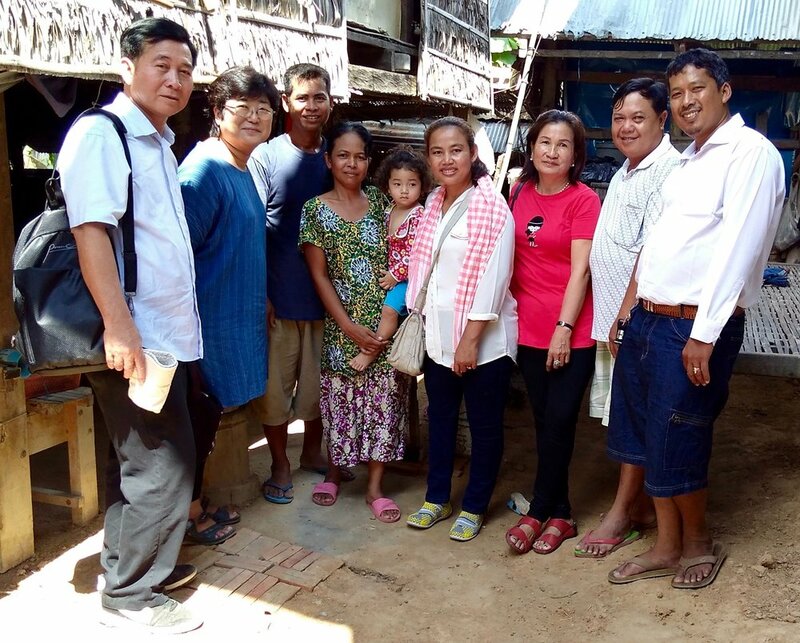 PIDAN KHMER / Caring for Young Khmer (CYK) is a Japanese NGO that originally started in 1980 to support Cambodian women and children in refugee camps in Thailand, then evolved in 1991 in Cambodia to provide for the healthy development of women and children in impoverished villages. 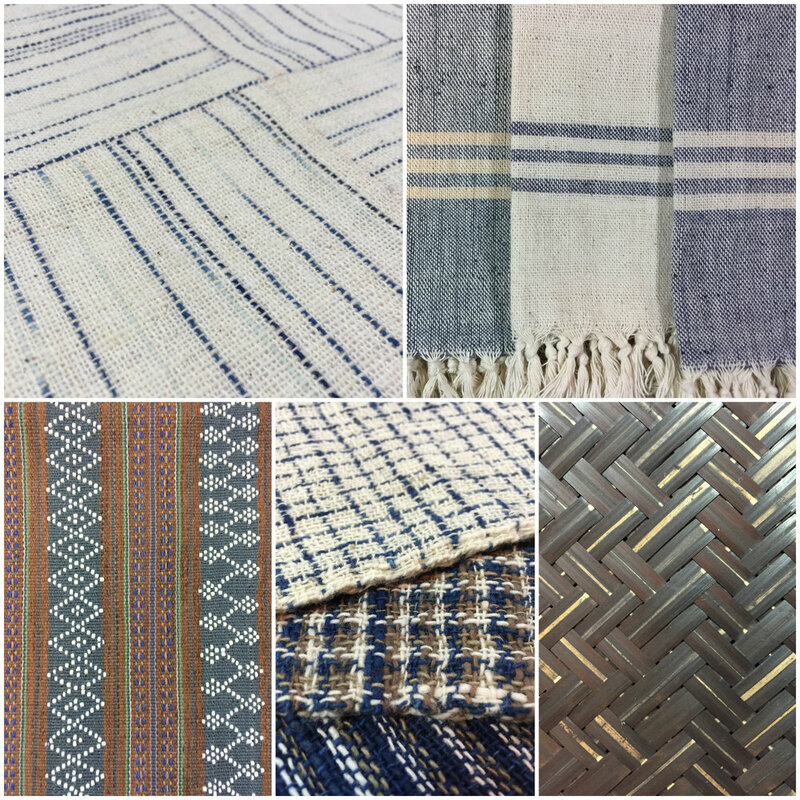 The weaving program was initiated to provide skills training to women and reintroduce the hol pidan (pictoral ikat) weaving and natural dyeing traditions which the elderly women once knew. 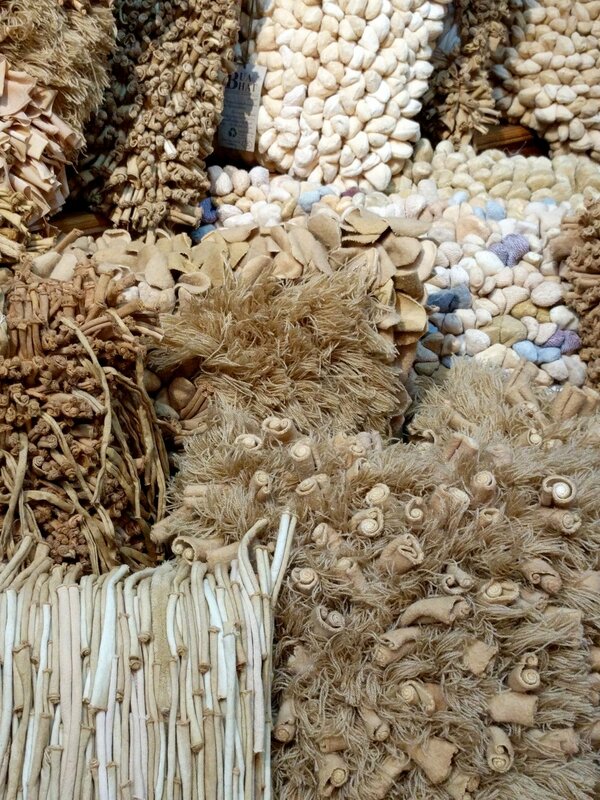 Hol pidan had typically been created as ceremonial wall hangings for temples. 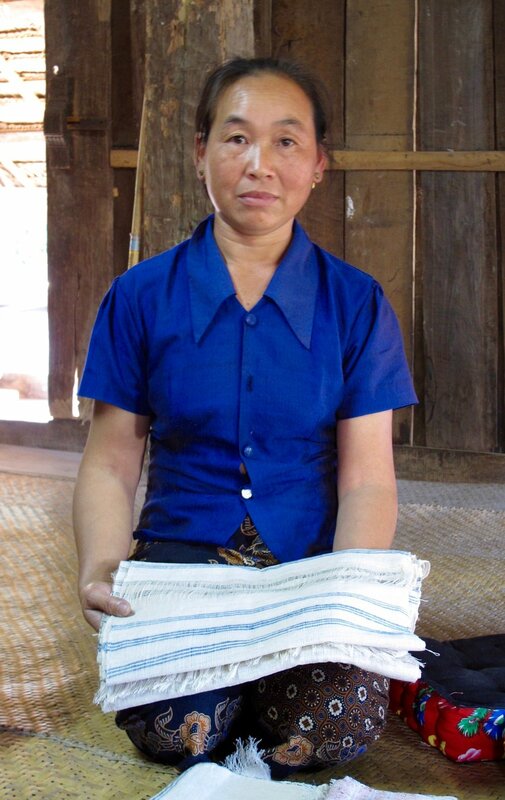 Harumi Sekiguchi, director of the Pidan Khmer/CYK in Phnom Penh, has been with the organization for nearly two decades. 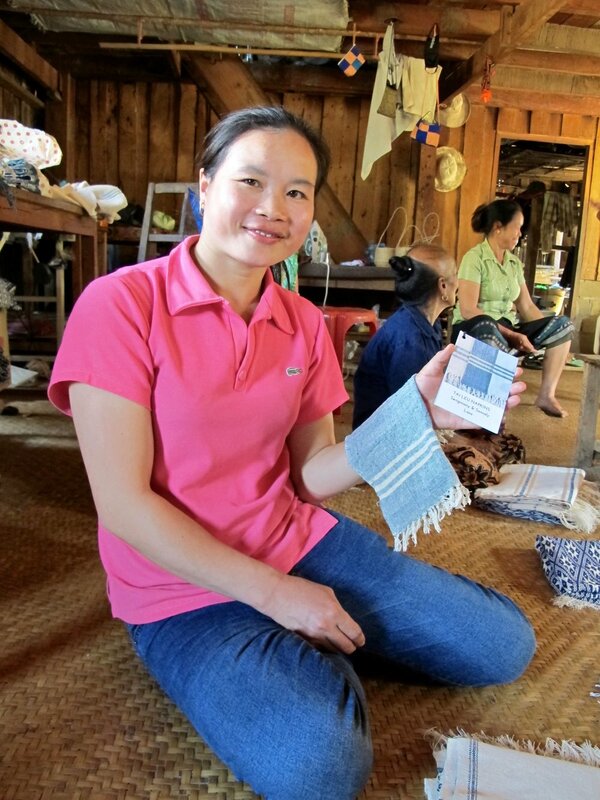 She has seen tremendous growth in the country in that time and has seen the continuing evolution of Cambodia’s weaving traditions. 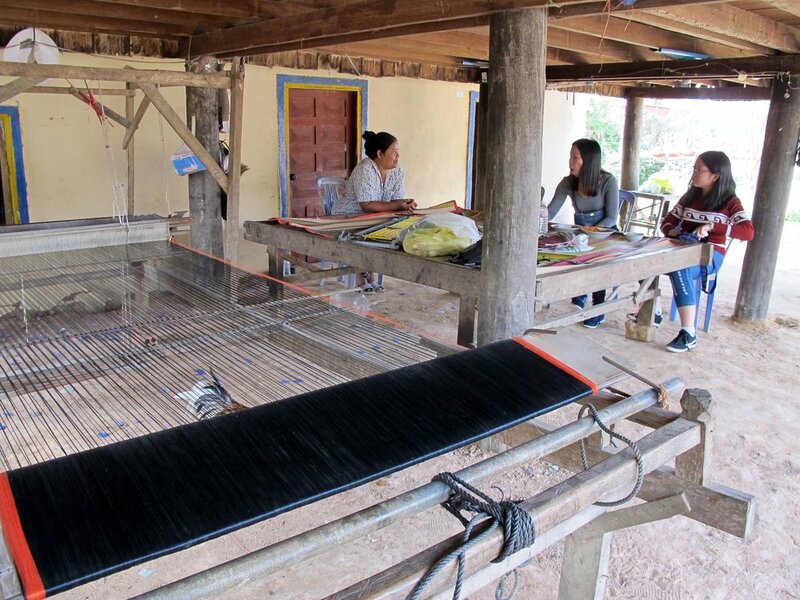 Our first stop was to Pidan Khmer/CYK's weaving and dyeing workshop in Trapeang Krasang village, an hour and a half south of Phnom Penh. 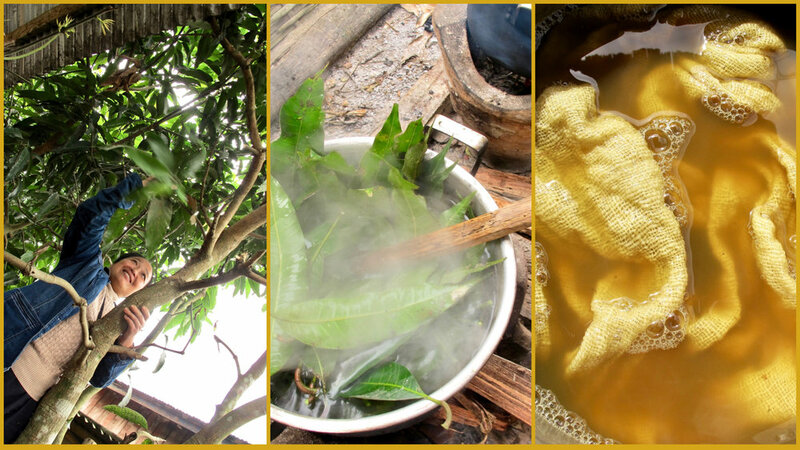 Pidan Khmer is best know for its revitalization and development of Cambodia's traditional hol pidan. 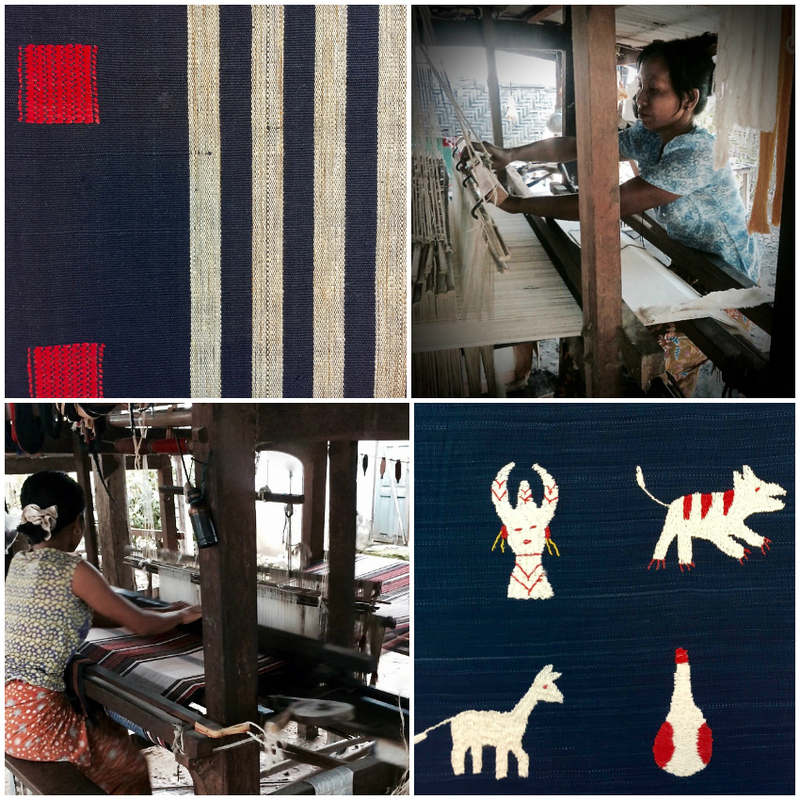 Last year they exhibited 11 new silk textiles at the National Museum of Cambodia, its historical significance presented in the scholarly journal, Southeast of Now: Directions in Contemporary and Modern Art in Asia. 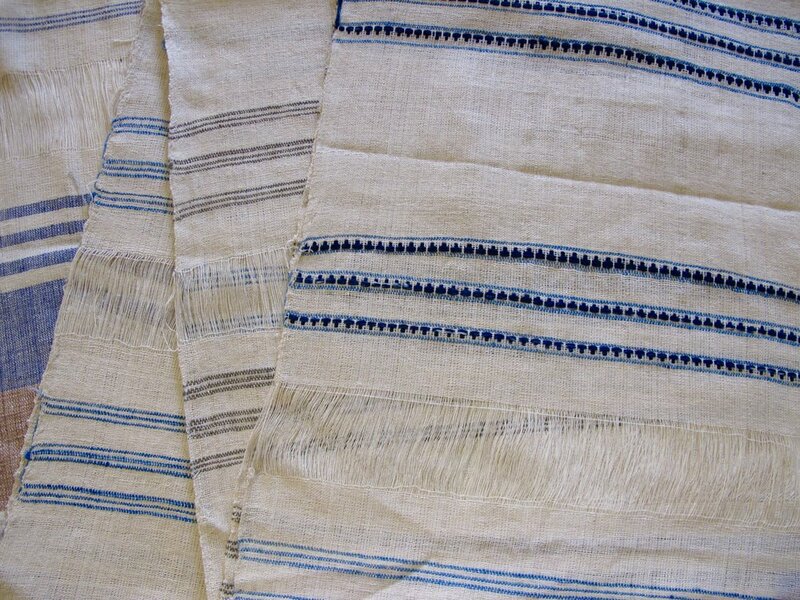 Top left: Khmer golden silk; Top right: naturally cultivated indigo dye; Bottom left: bound hol threads creating a pattern; Bottom right: finished indigo hol pidan, one that was exhibited at the National Musuem of Cambodia. 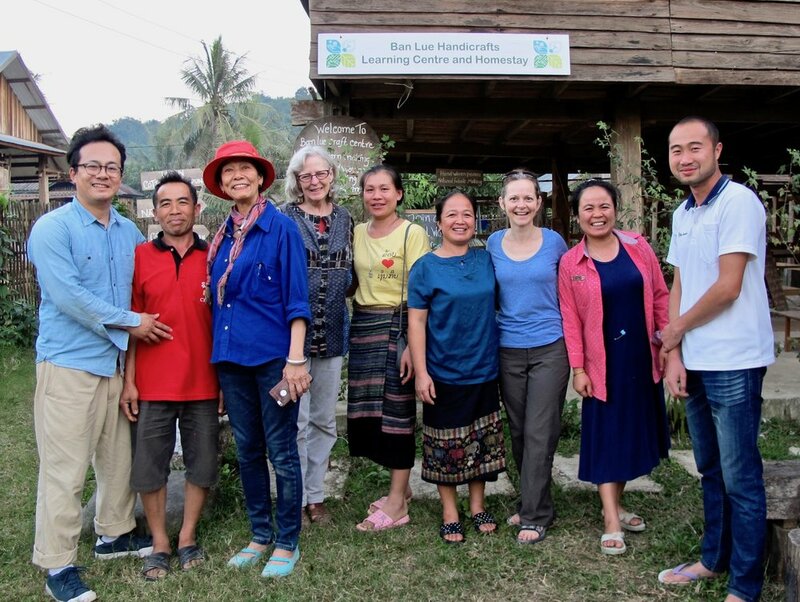 Our next stop was to Kamchan Village, near Chisor Mountain Temple in Somraong District, where we met the hol pidan weavers. 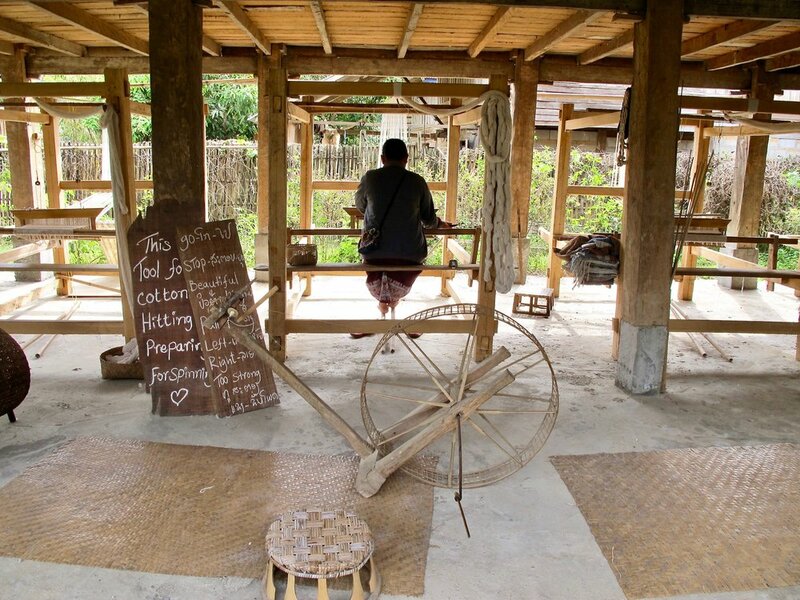 A traditional Cambodian wooden stilt home, where weavers work at looms underneath their house. Pidan Khmer hol pidan weavers, Pech Ly Kim and Pech Ly Phally, aunt and niece. 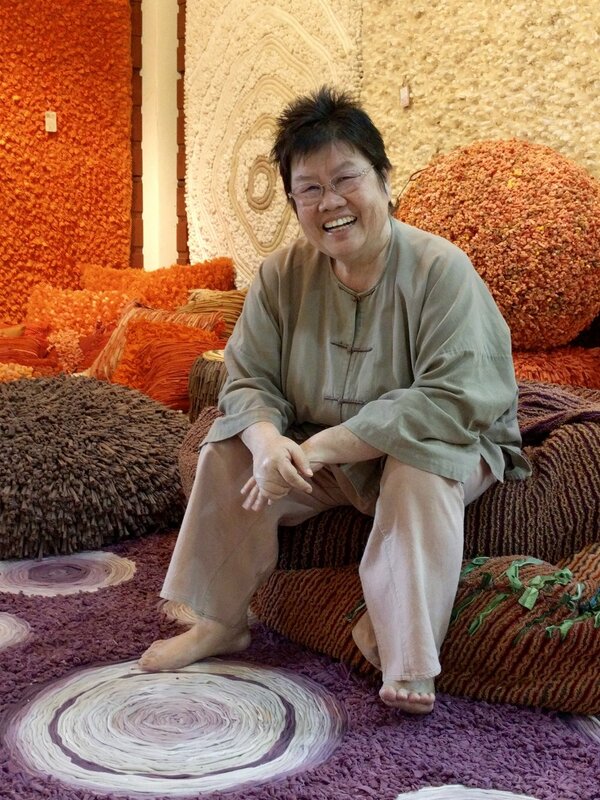 My respect for hol pidan grew when I met and saw the work of Pech Ly Kim and Pech Ly Phally, two master artisans who bring the pictorial images to life in golden silk textiles. 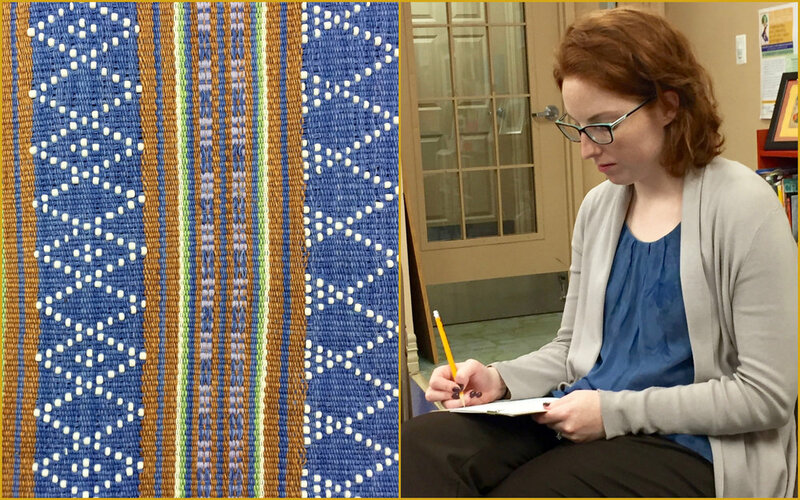 The skill, patience, and focus needed in this intense technique is significant, and I think of the many dedicated women throughout history and the women who continue to create extraordinary textiles all over the world. 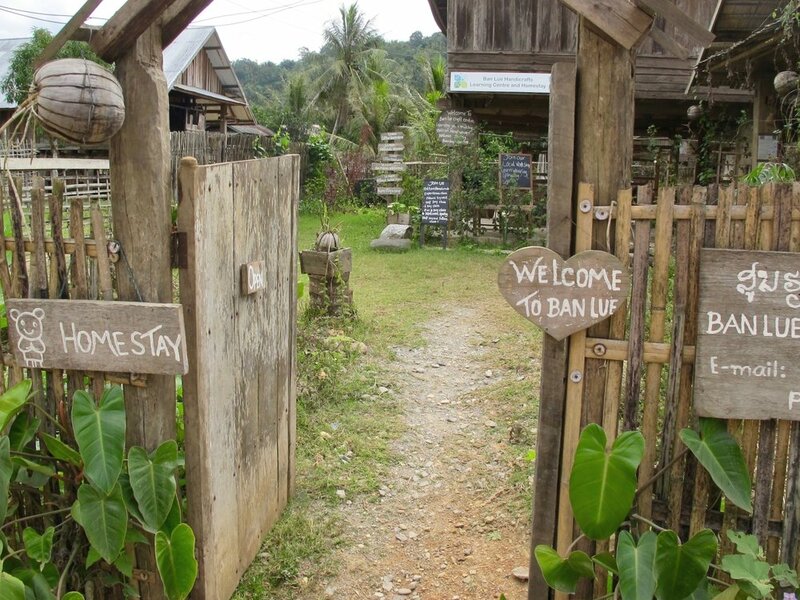 It was on this trip that I could see the once dying art of hol pidan revived. It reminded me, once again, why global artisans matter so much. 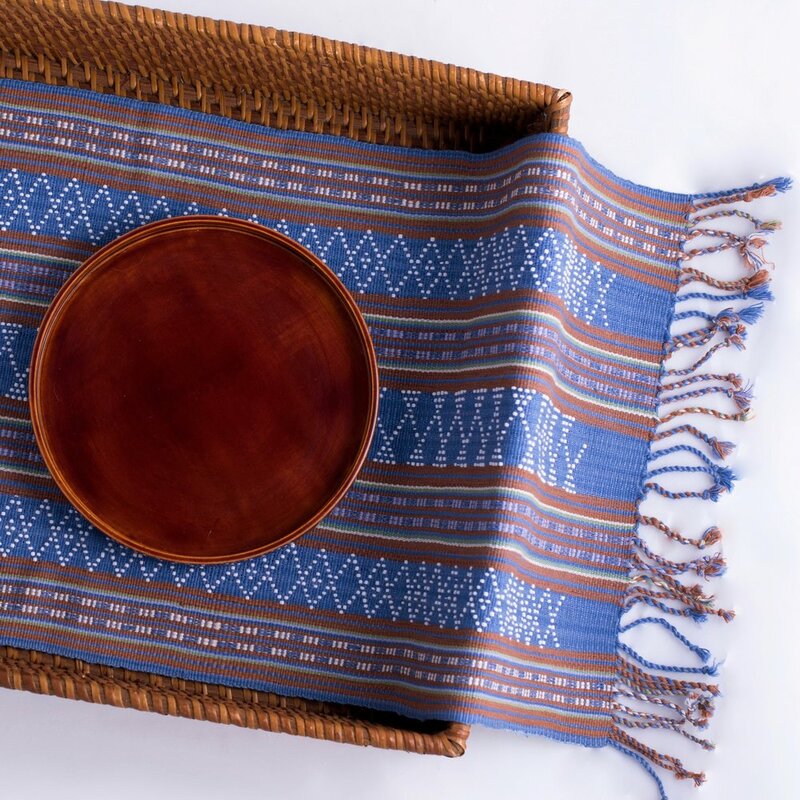 They are the keepers of their cultural heritage, preserving ancient craft traditions, passing their knowledge and talent through generations, and carrying it into the future. 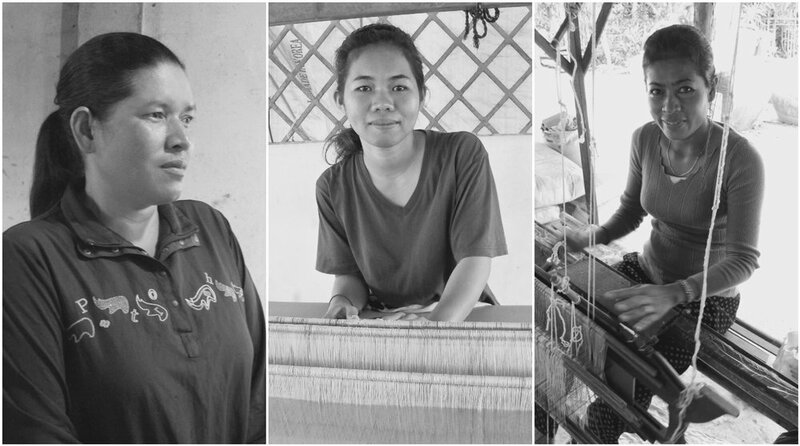 In learning about the context of handmade textiles in Cambodia, by tugging on one thread leading to another thread and the unraveling of a whole tapestry, reveals a resilient people, a rich culture, and so much more. Naihoang and her niece Gueckhour picked me up at my hotel and off we went, driving out of Phnom Penh and towards somewhere. 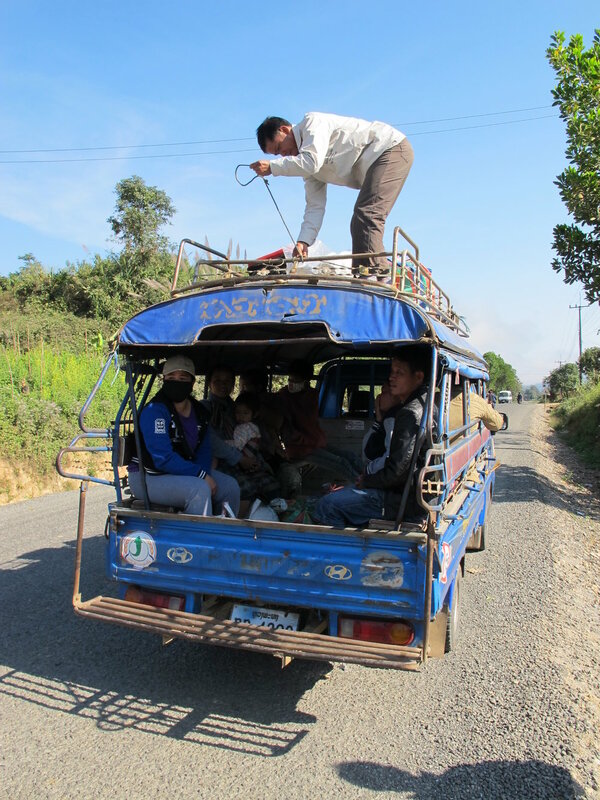 I didn’t know a road trip was our plan (that detail not clarified in our email), but we were on our way to visit one of Craft Village’s master weavers two hours south. 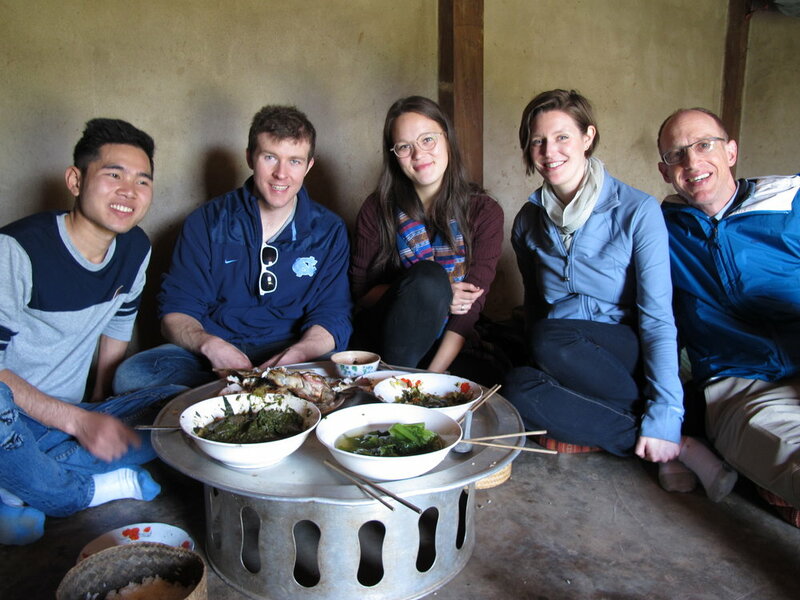 I was elated of course and getting to know Naihoang and Gueckhour there and back made it even more fun. 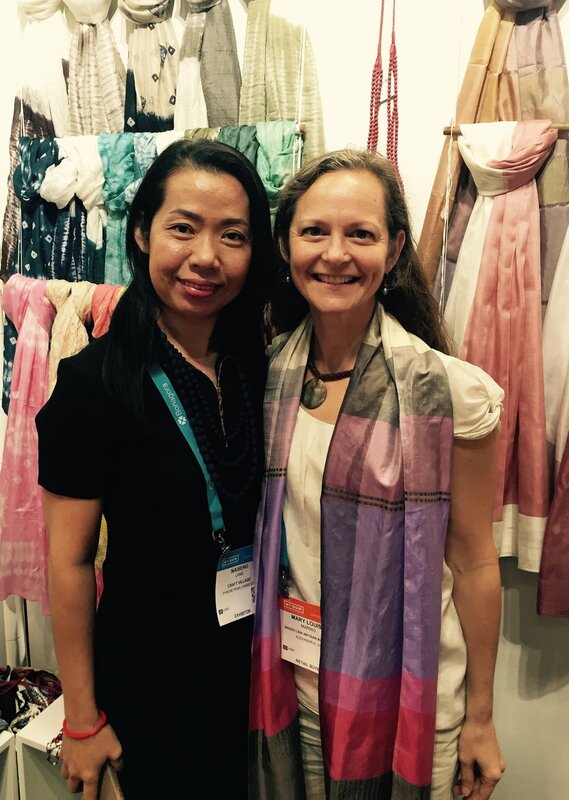 I had met Naihoang's sister, Naiseng, at NYNOW a year prior and was lured by Craft Village’s handwoven silk scarves, determined to visit them on my return trip to Cambodia. 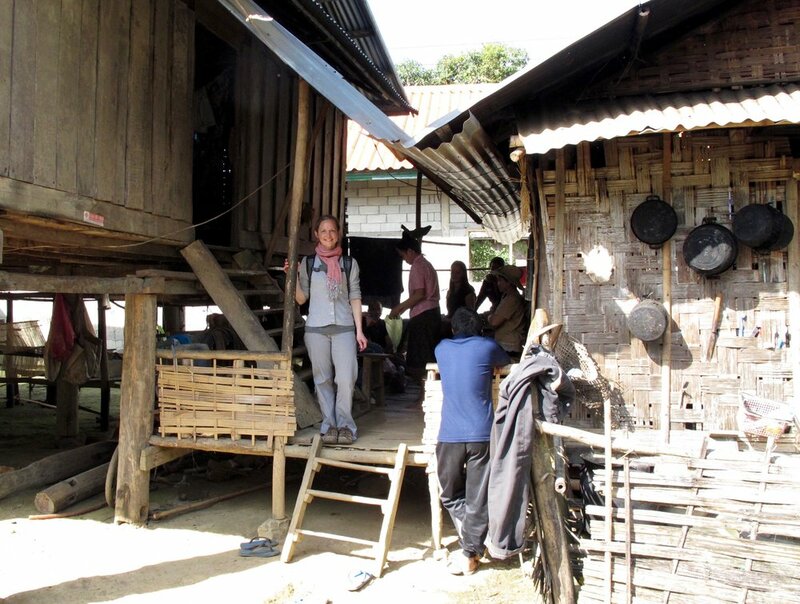 Sokhom welcomed us to her home in Ta Non village, Takeo Province. 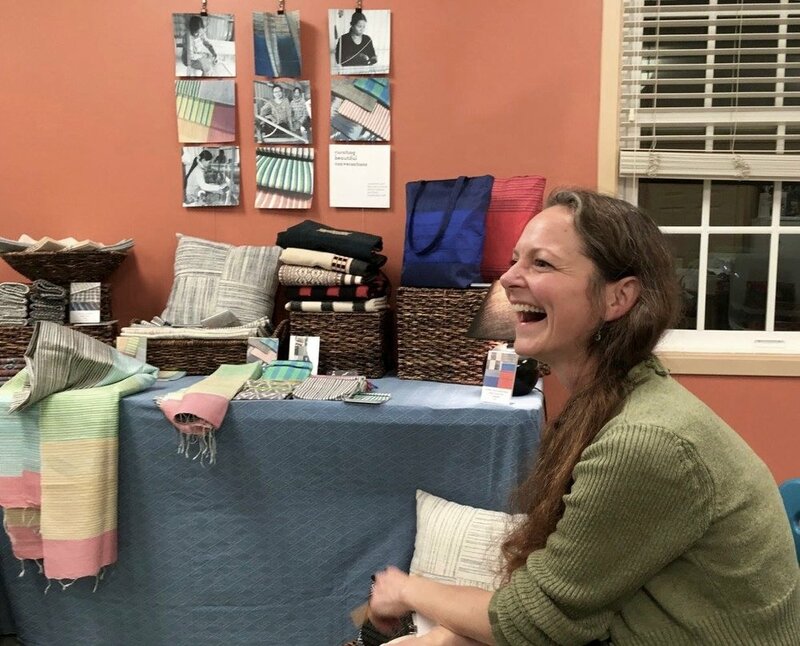 She showed us the beautiful silk scarves she designed, having learned weaving as a girl from her mother and grandmother and great-grandmother before that. 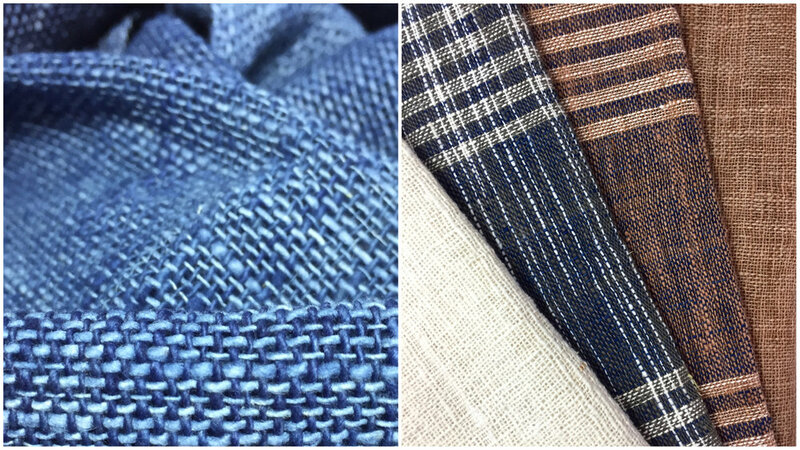 Sokhom is known for combining rough and smooth silk, using subtle, subdued colors that evoke presence. 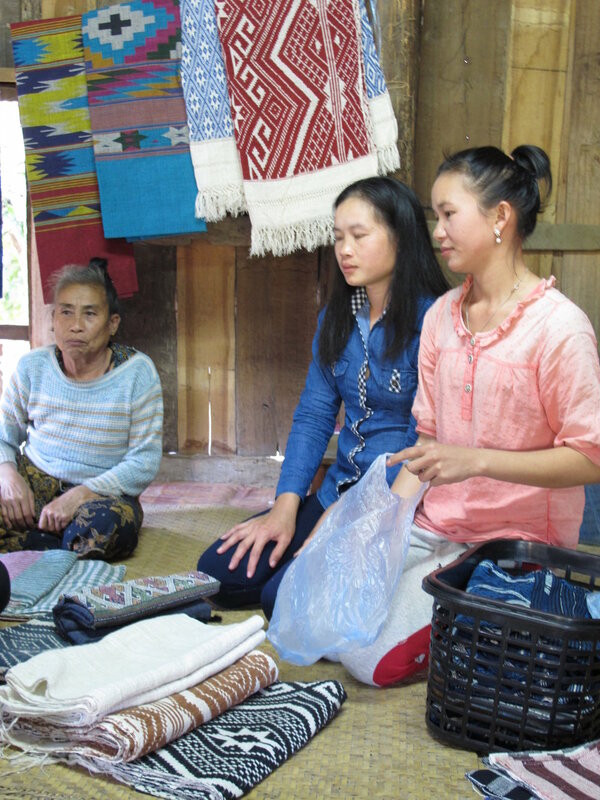 Additional training in textile design and color dyes through community development grants, as well as working with Naiseng, helped refine her talents that evolved into creating her own style. 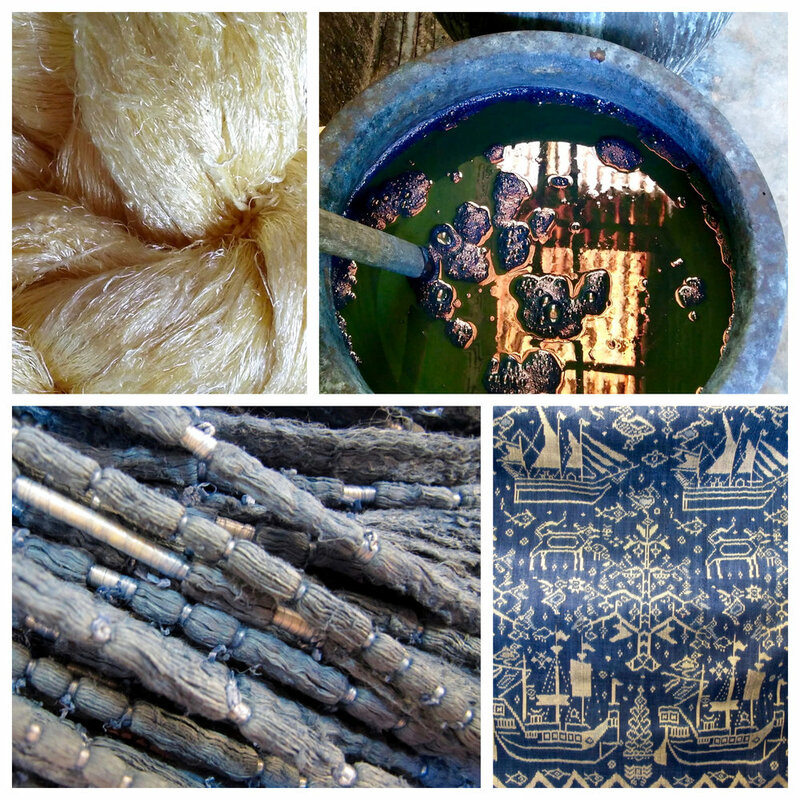 One of my intentions for this trip was to know more about the materials, processes, and context of handmade textiles in Cambodia. 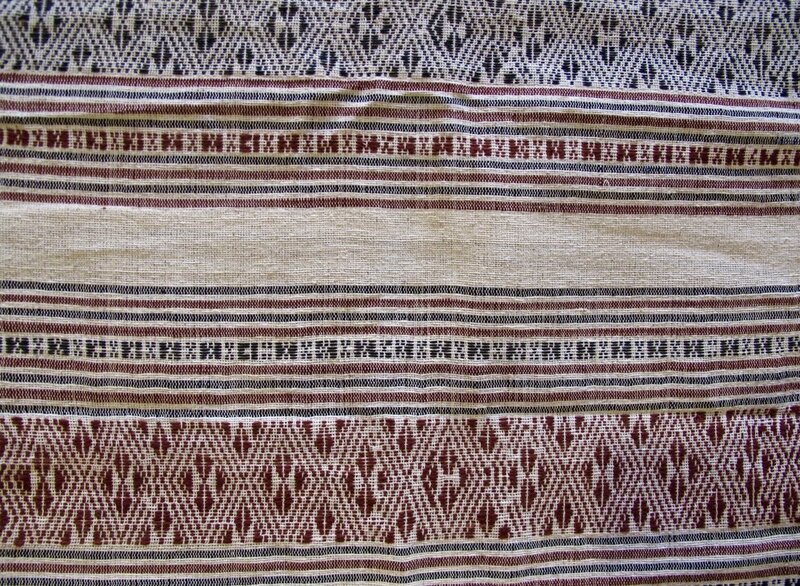 I came to know that traditional Cambodian silk, or Khmer golden silk, dates back many centuries. 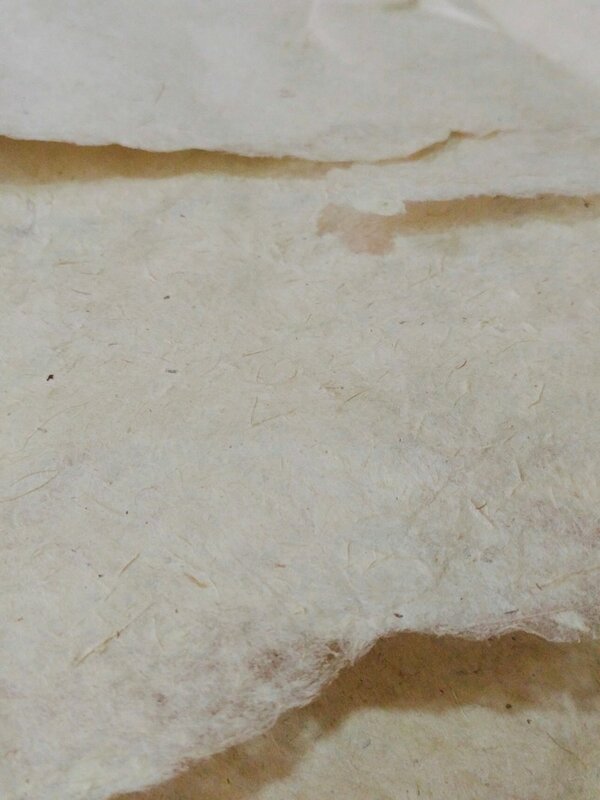 The knowledge of sericulture, or the raising of silkworms for the production of raw silk, had also nearly died out. There's been a modest revival over the decades, but it remains a luxury. 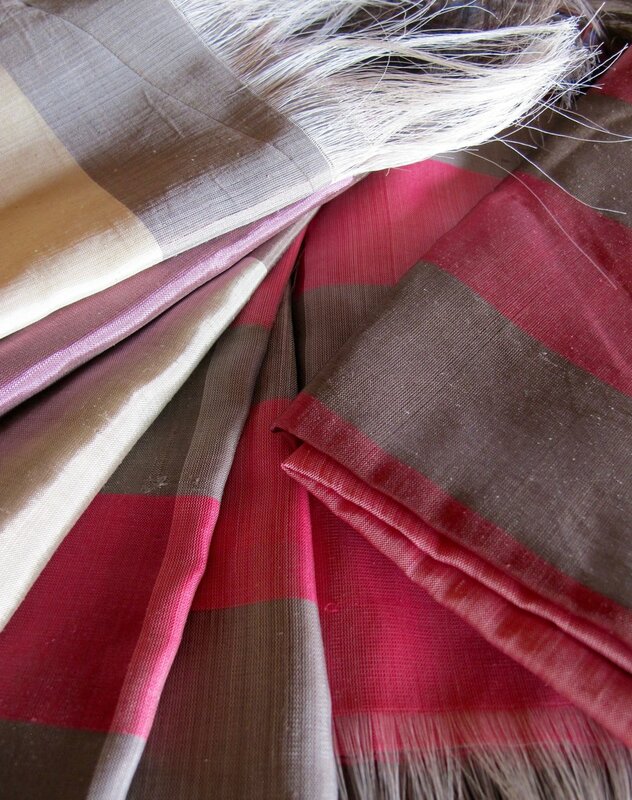 To meet the current demands of silk textile production in Cambodia, white silk from Vietnam is imported. 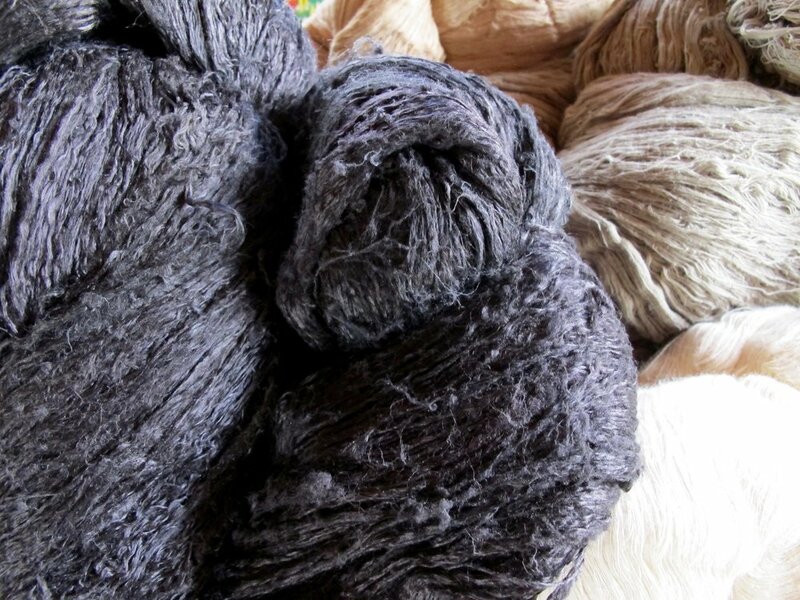 Sokhom admits that she prefers working with Khmer golden silk for its high quality and ease in weaving, but it’s not readily available for her to buy locally. 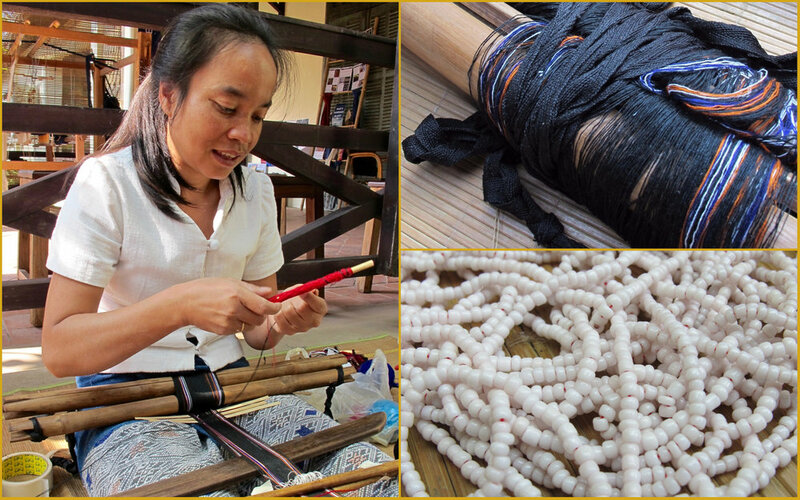 So she buys the white silk imported from Vietnam, both fine and raw bundled silk thread. She then dyes the threads using both natural and low-impact dyes, finally spinning the thread to prepare it for weaving on her loom. 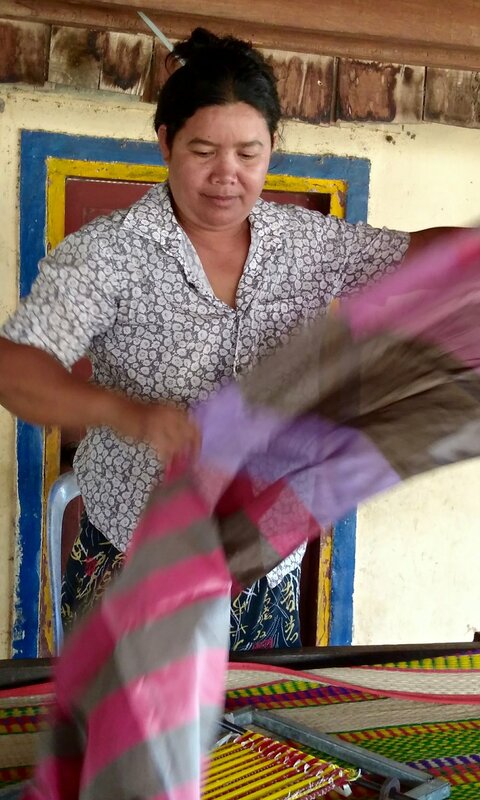 While we were there, she was preparing silk threads with a pattern for hol (ikat) dying, but admitted that she doesn’t really want to do hol weaving. It takes too long and it doesn't earn her as much money. 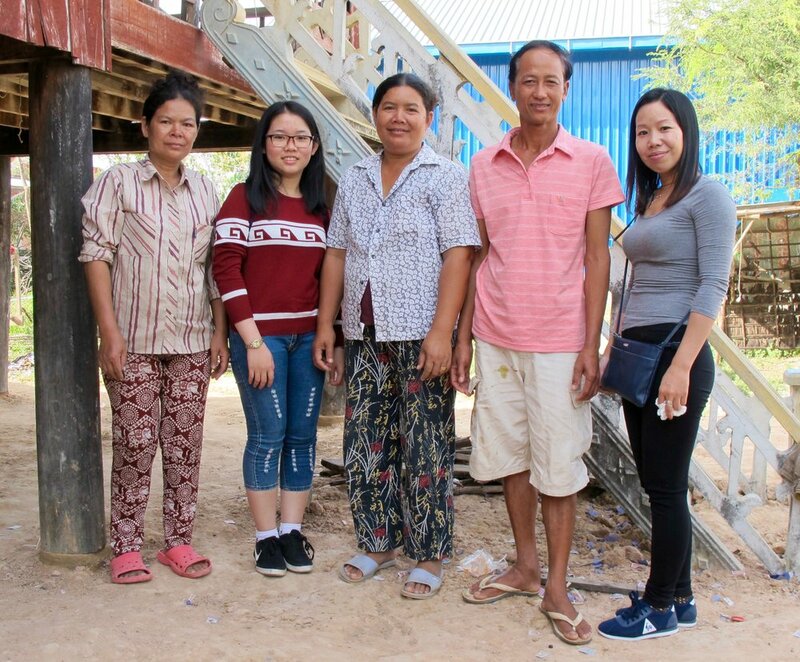 Sokhom’s gratitude from working with Craft Village over the years was palpable, and Naiheang shared that both families had come to know each other well, creating a trust that was special. 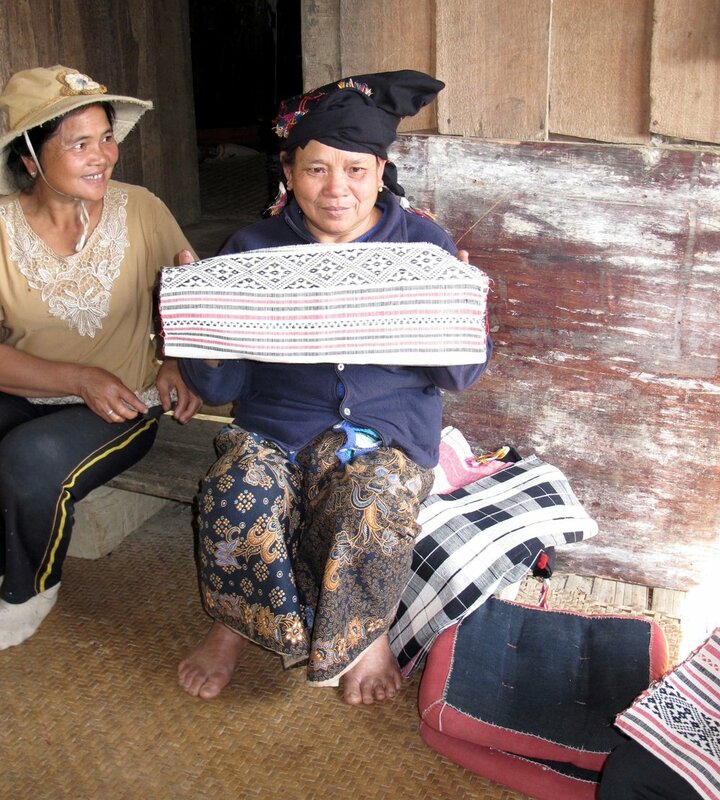 She has been able to support her family with weaving, and that’s been very important for her. 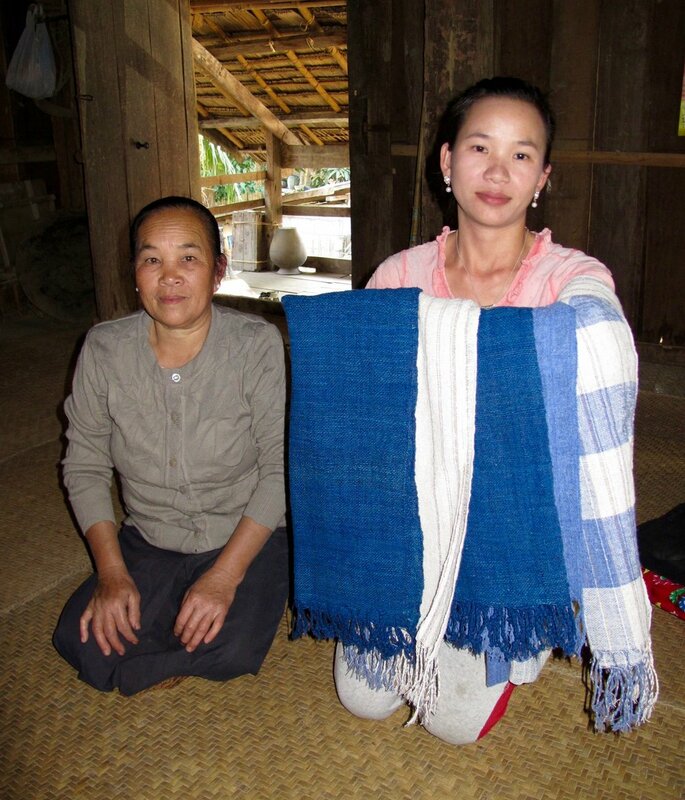 I felt grateful to meet Sokhom and to learn how weaving has given her a better life and broader opportunities. 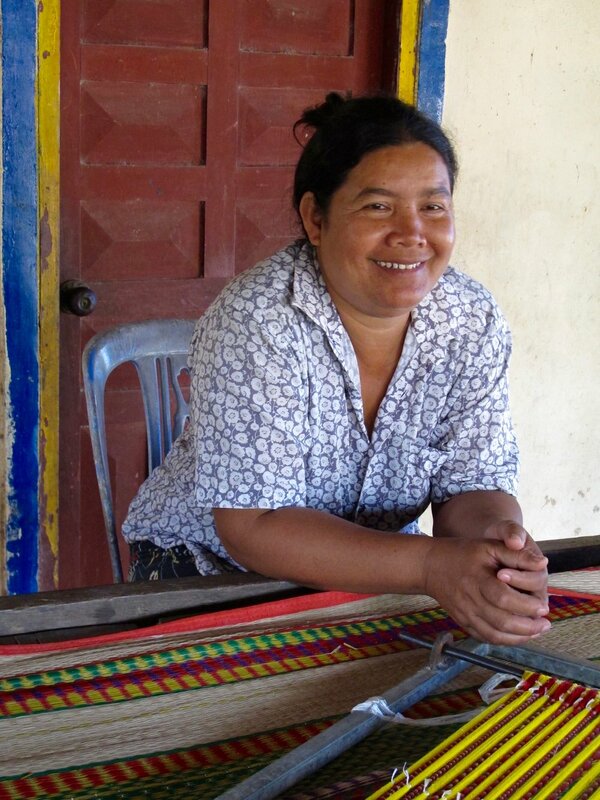 While her three grown children were all taught how to weave, none are pursuing weaving as a livelihood for income. Sokhom struggles to get enough orders as she once did. 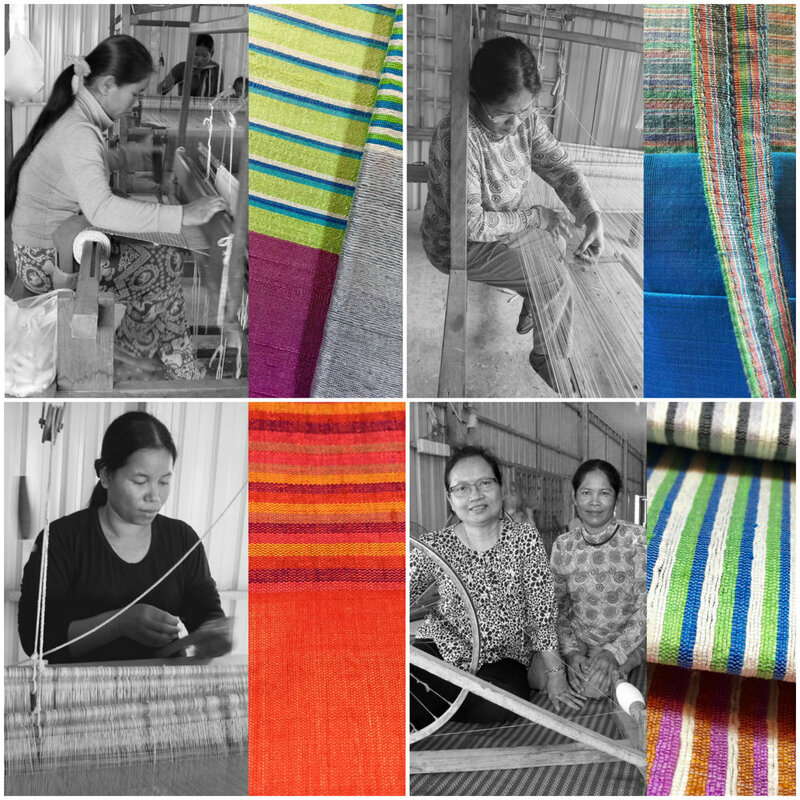 The current socio-economic changes in Cambodia challenge the sustainability of its skilled weaving traditions. It is set against the increasing presence of garment factories that employ many young women to urban places, confronting gender norms in the process. 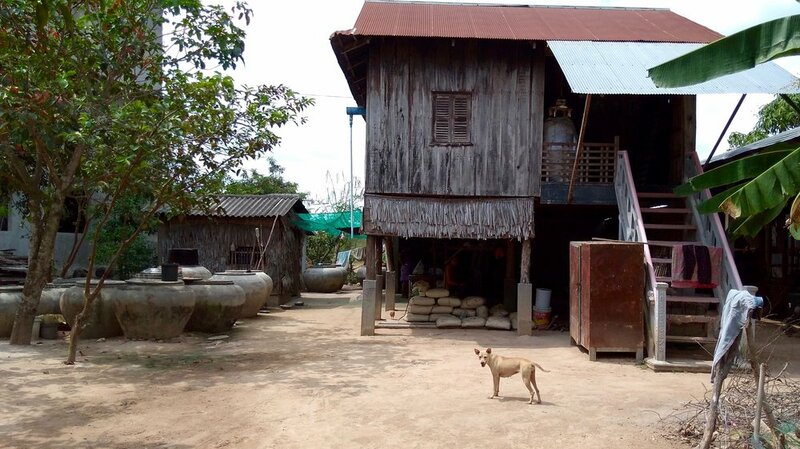 My friend Yennie Tse of Fourth Sector Collective wrote an insightful piece, Daughters of Cambodia: Past and Future, that says it all so well. 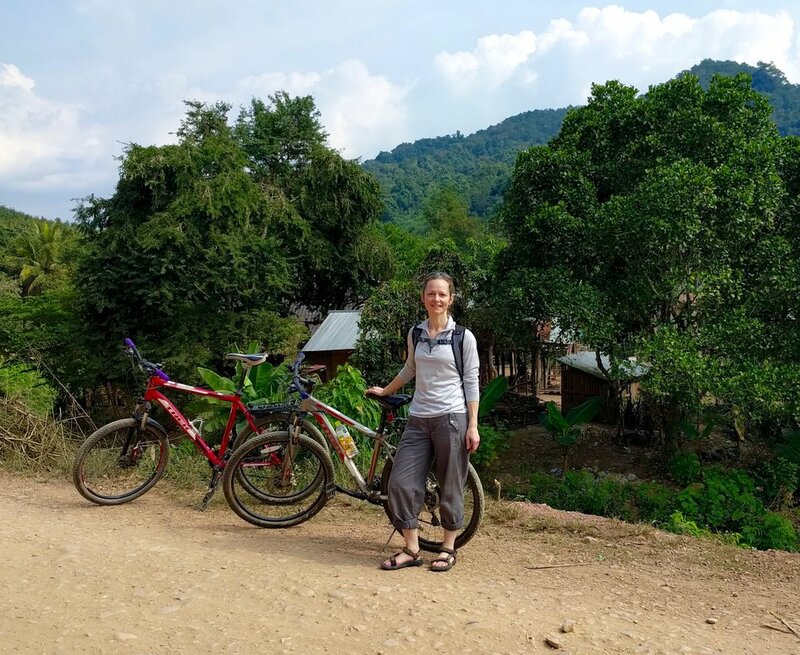 Yennie also wrote, "It isn’t until we get a deeper understanding of a society and its people that we can truly appreciate or be effective partners." 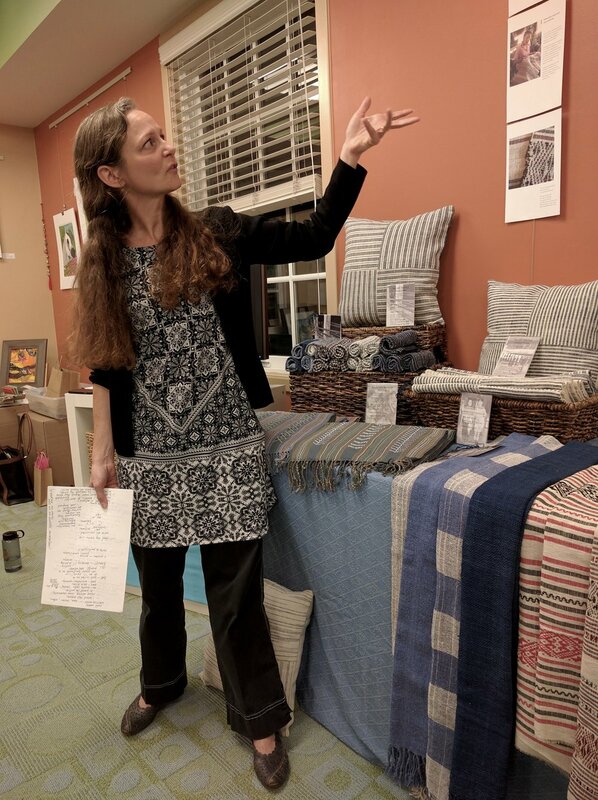 In learning about the context of handmade textiles in Cambodia, by tugging on one thread leading to another thread and the unraveling of a whole tapestry, reveals a resilient people, a rich culture, a brutal recent history, and forces in regional economics and government positions that continue to alter the warp and weft of Cambodia. 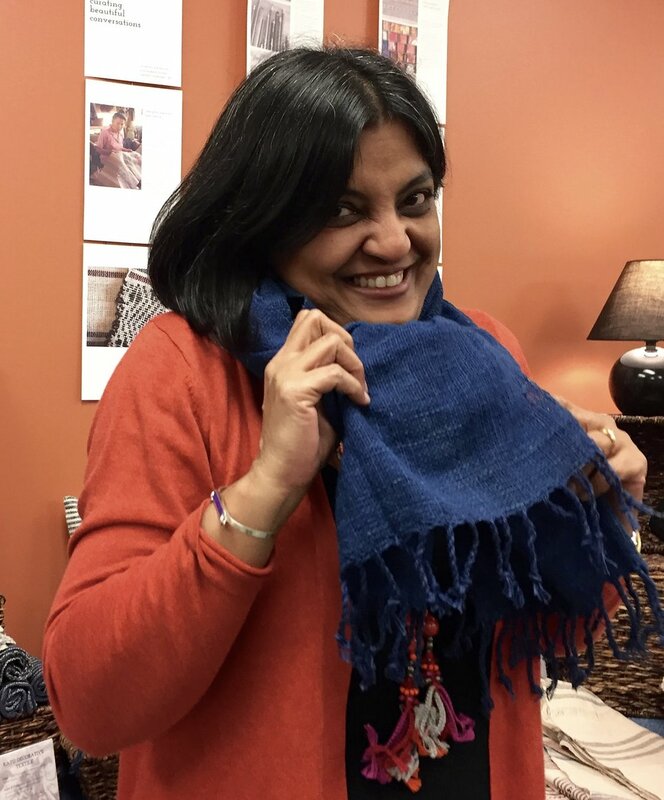 A selection of Sokhom's scarves came home with me, acquired for Indigo Lion's Cambodia Collection. They are that much more meaningful. I met her. Her scarves are woven with her energy, her story, her worry, her hopes. 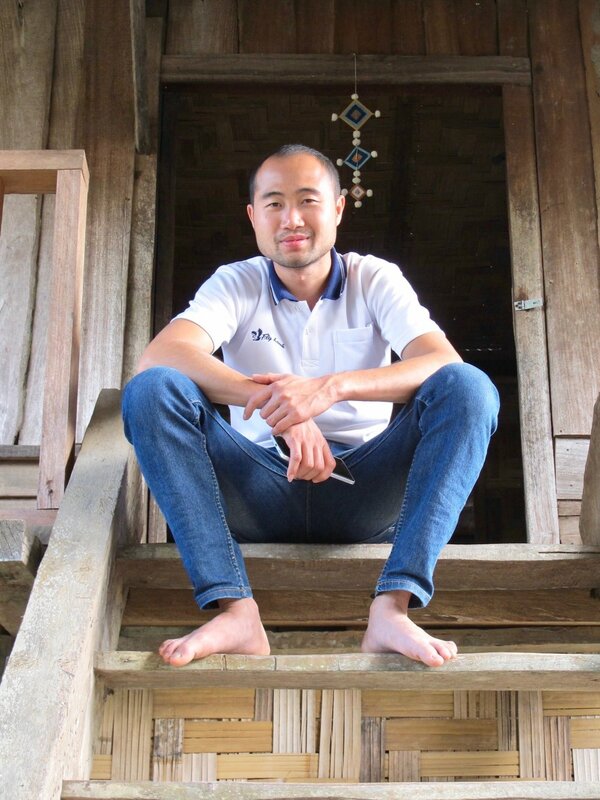 They connect me to a better understanding of Cambodia. 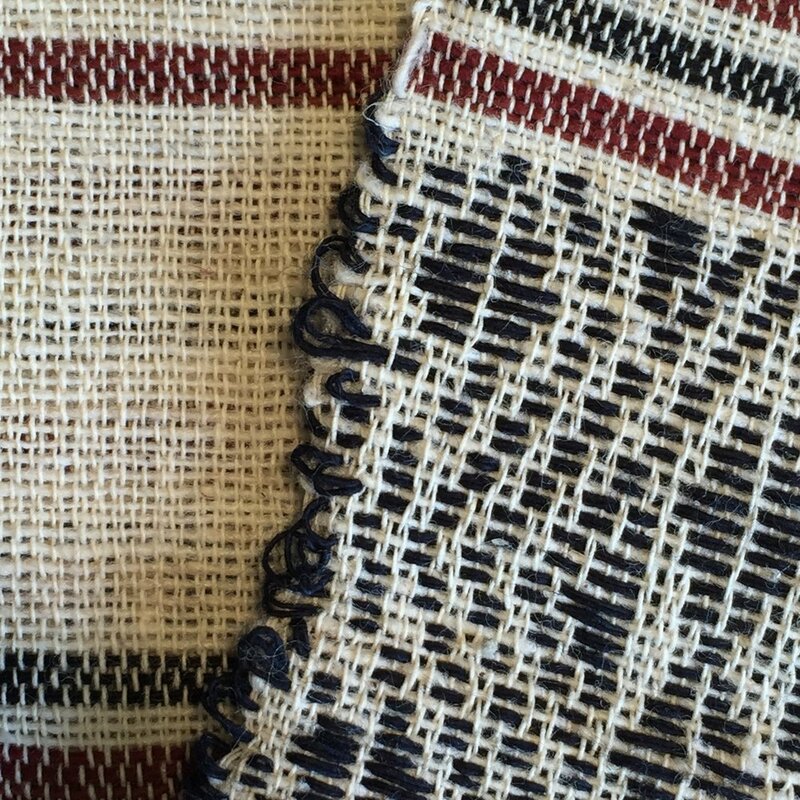 The story of Sokhom's scarves continues, from her hands to mine, from mine to yours.